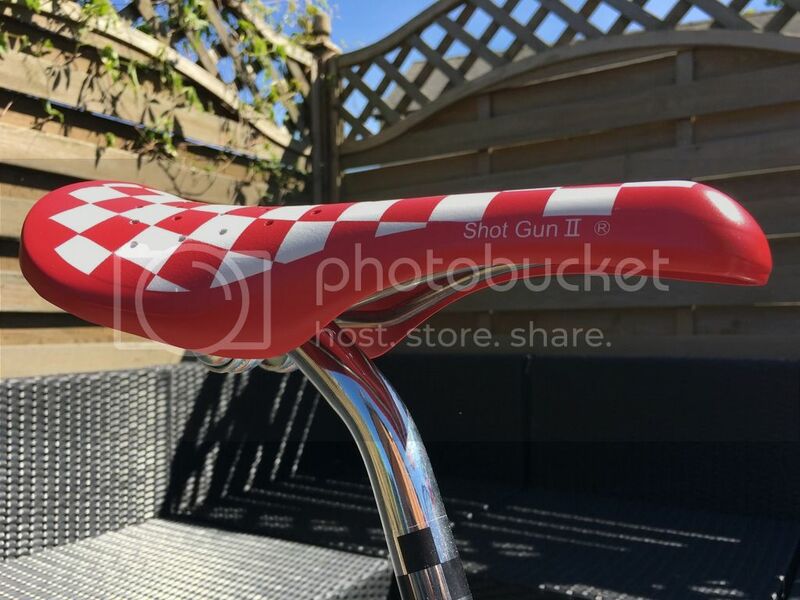 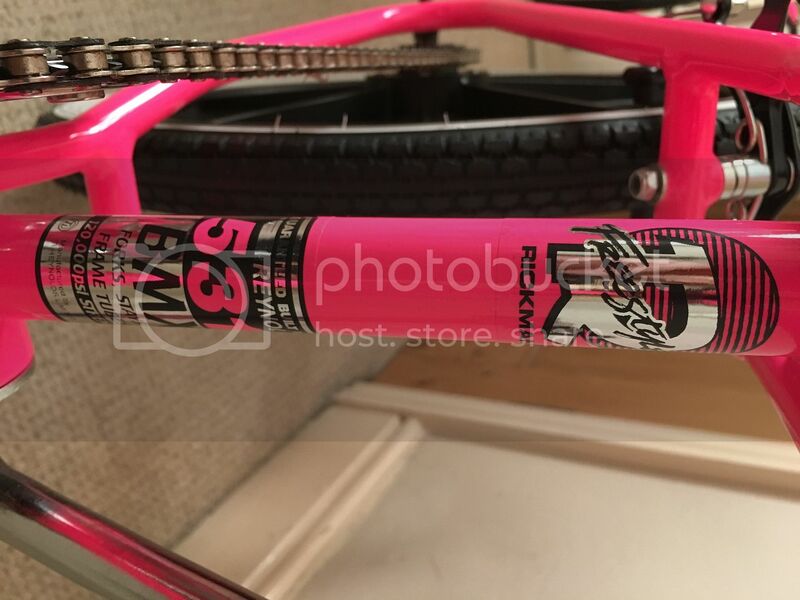 NOS ODI Mushroom II Greg Hill Signature edition Grips. 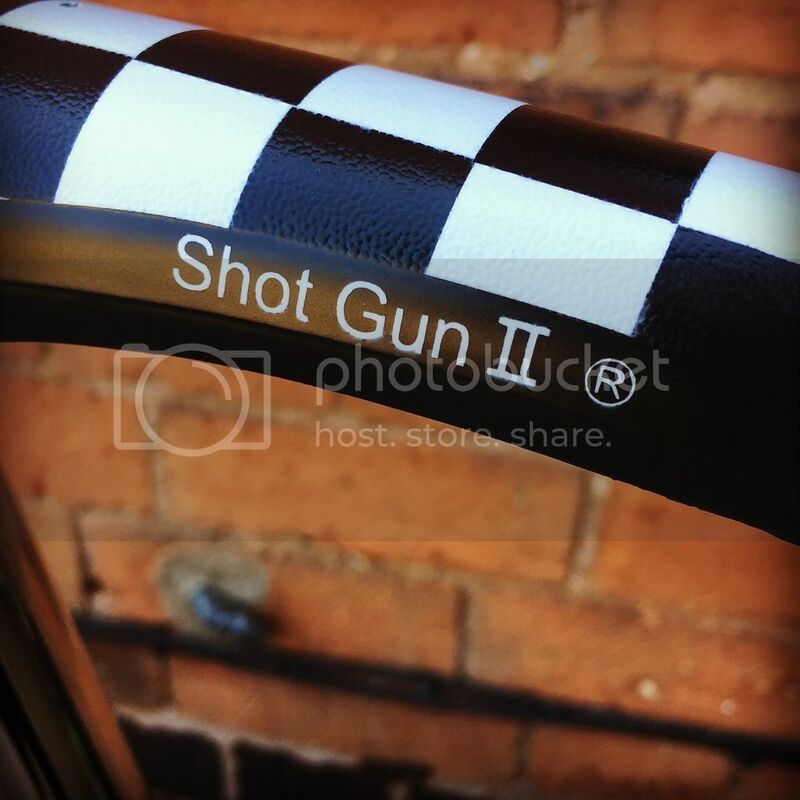 Big thanks to Del for Working with me on the Decals. 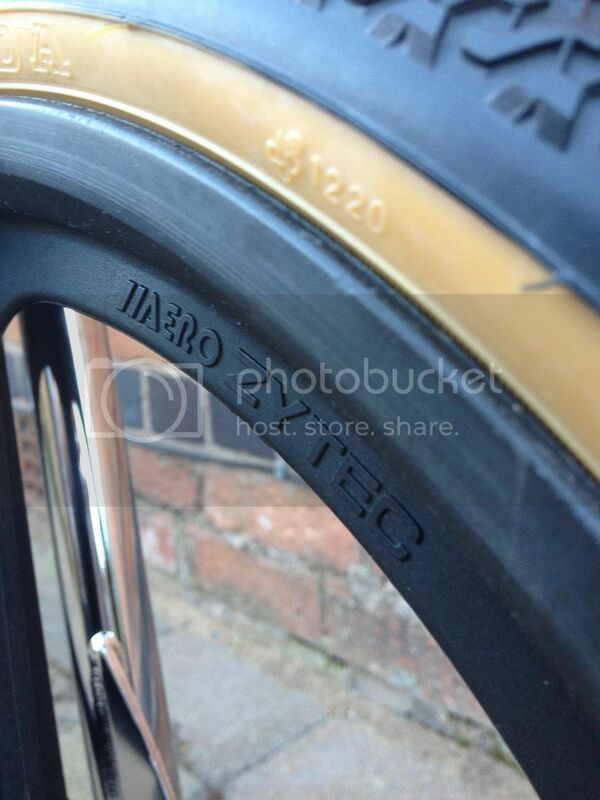 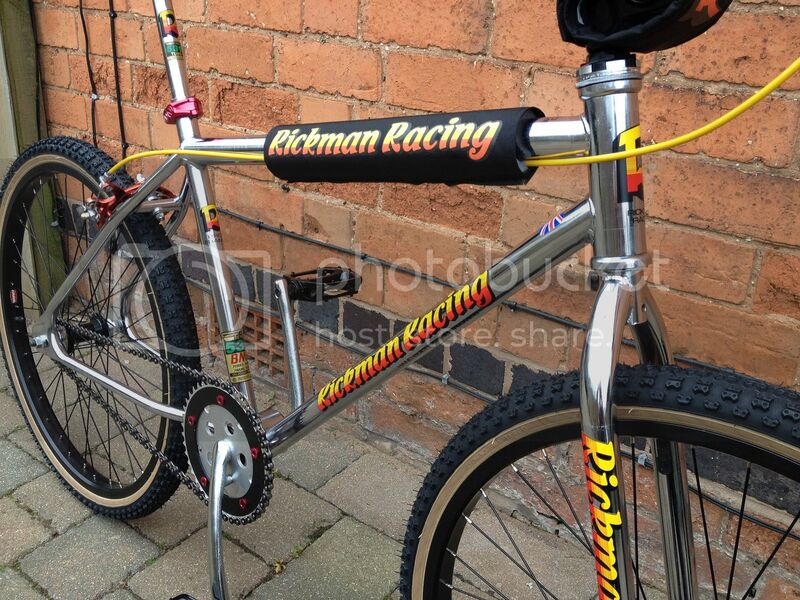 Not so much a Rickman Pro 24” but more a Rickman Faux 24” ! 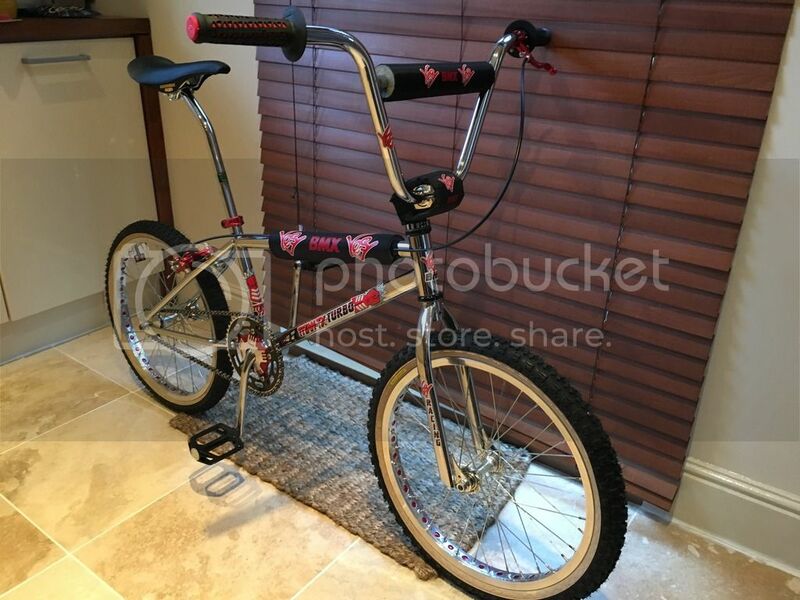 My Latest Build. 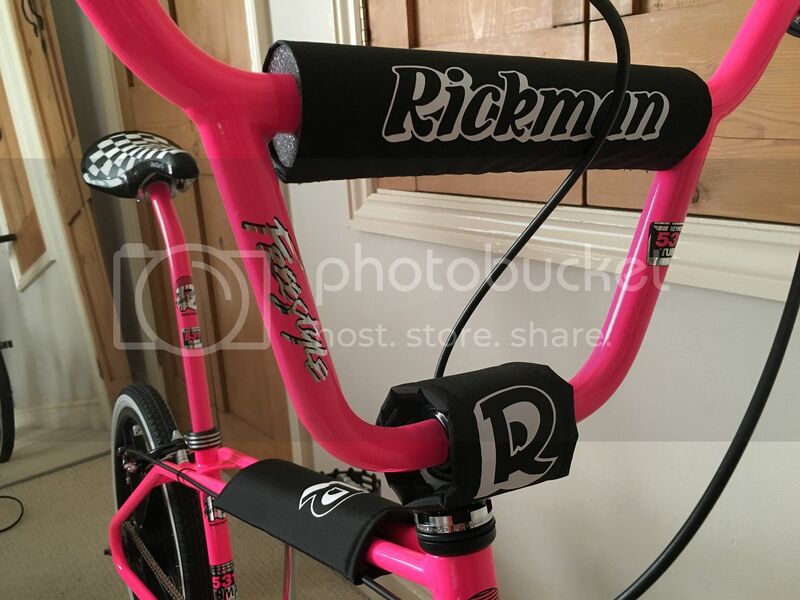 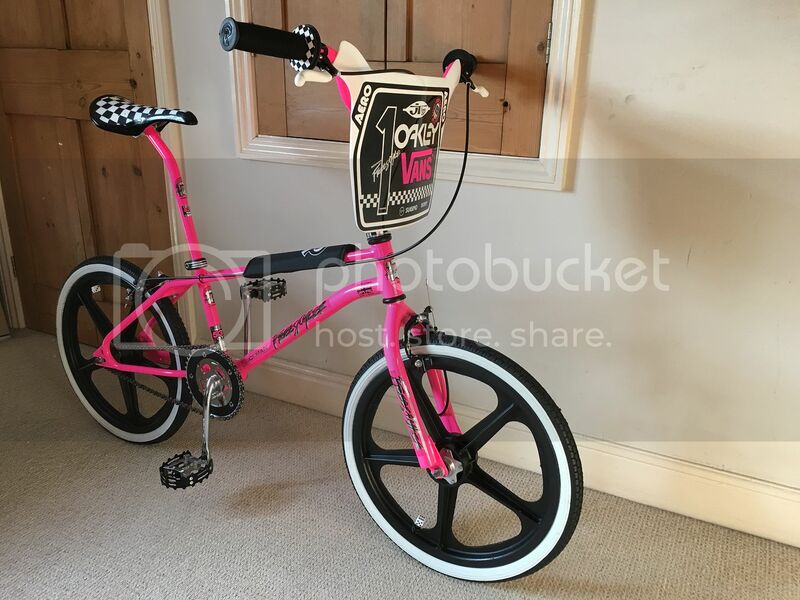 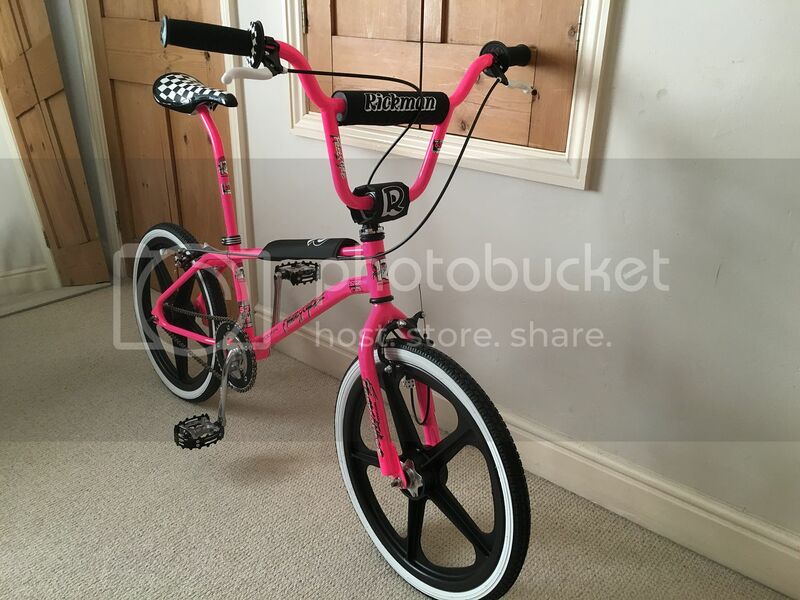 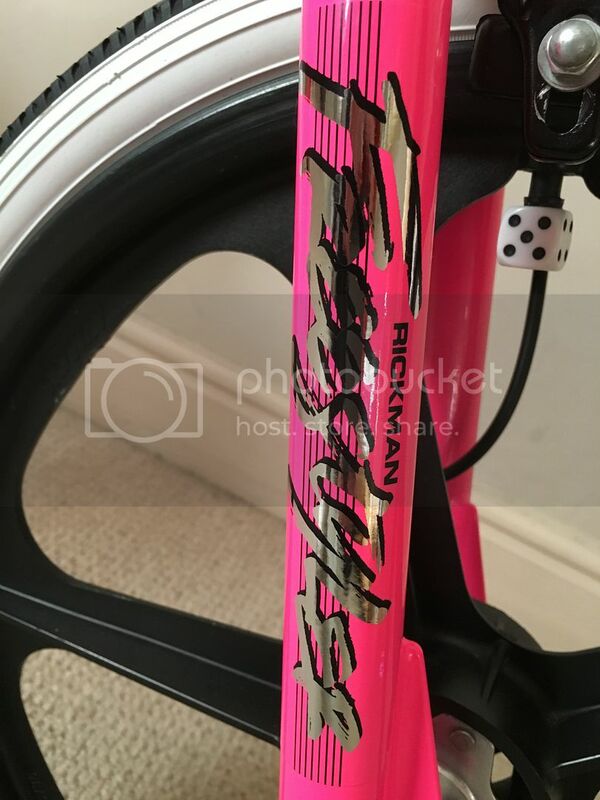 Custom Neon Pink Rickman Freestyler. 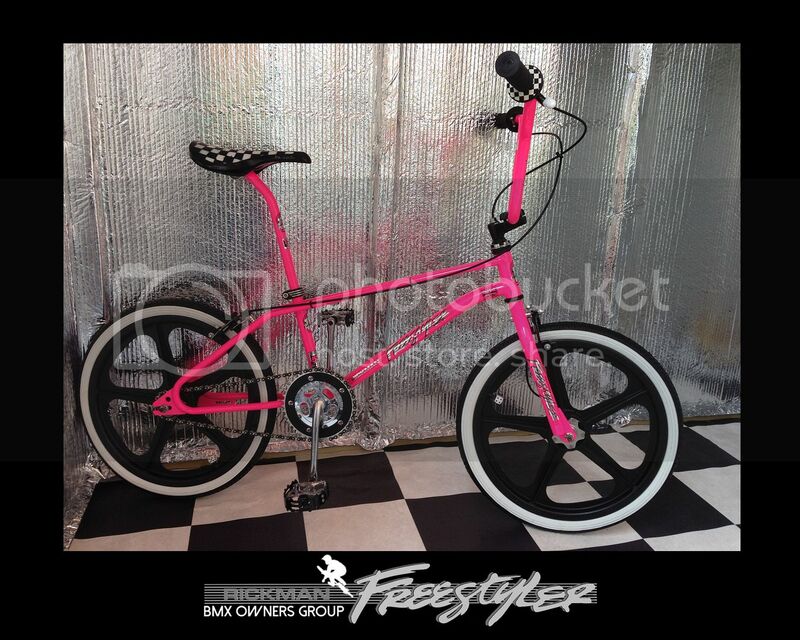 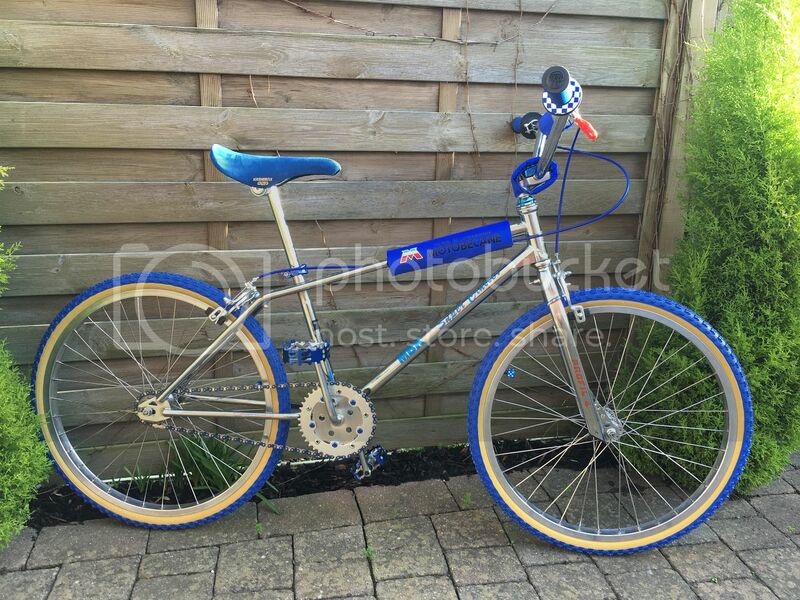 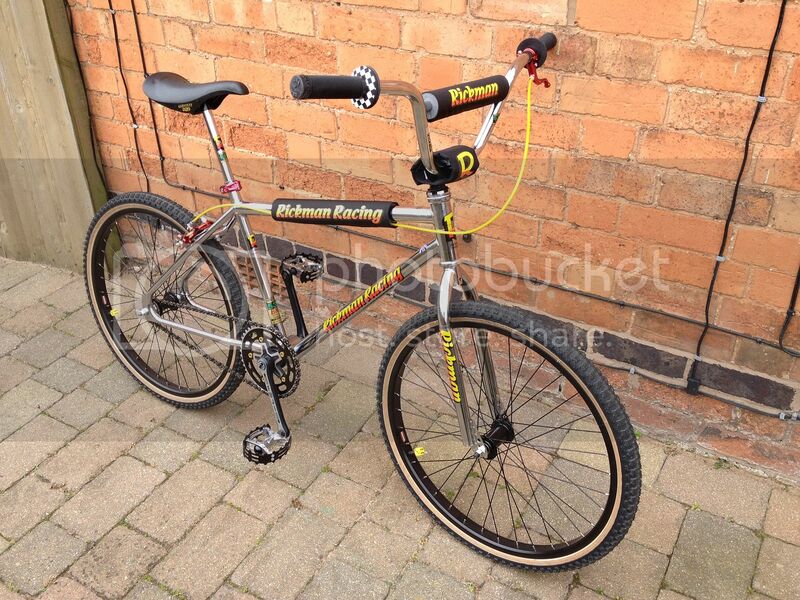 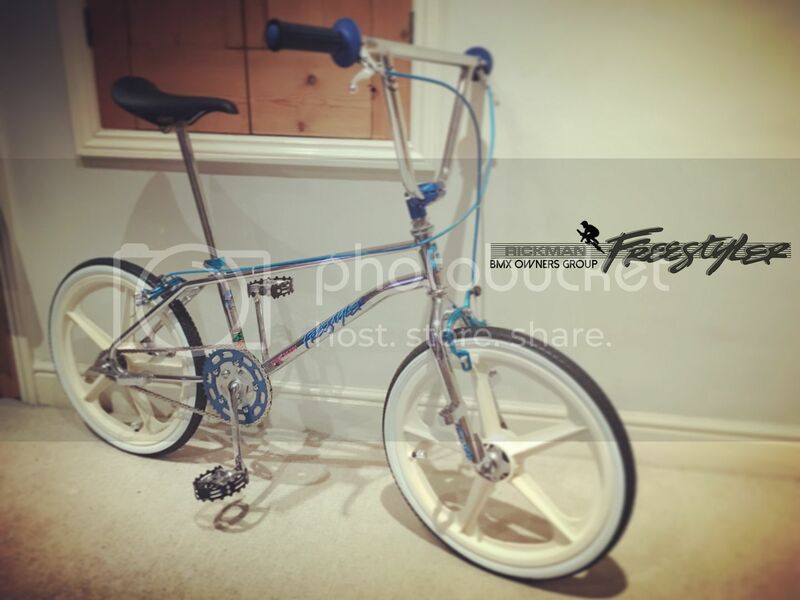 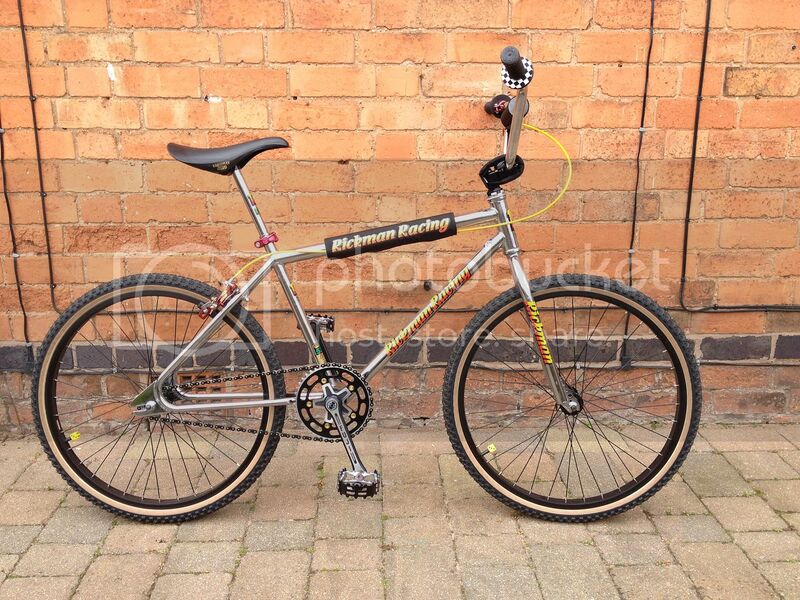 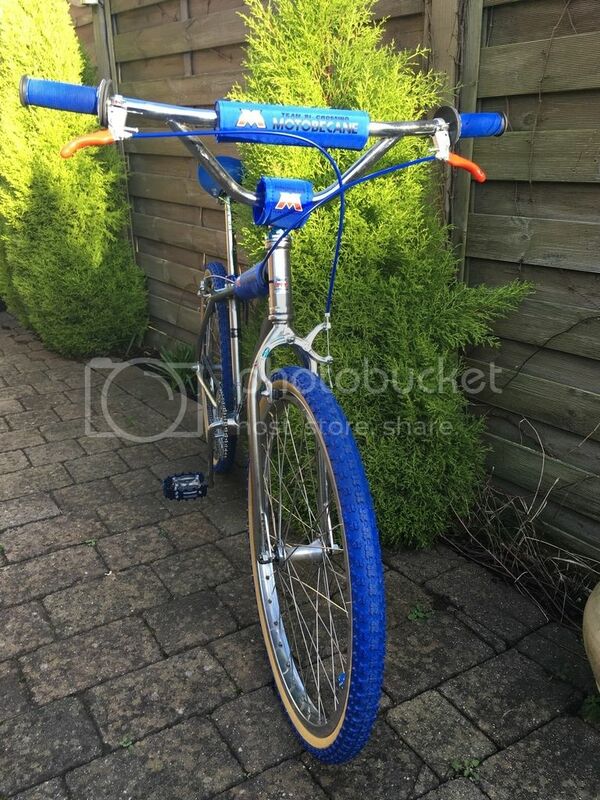 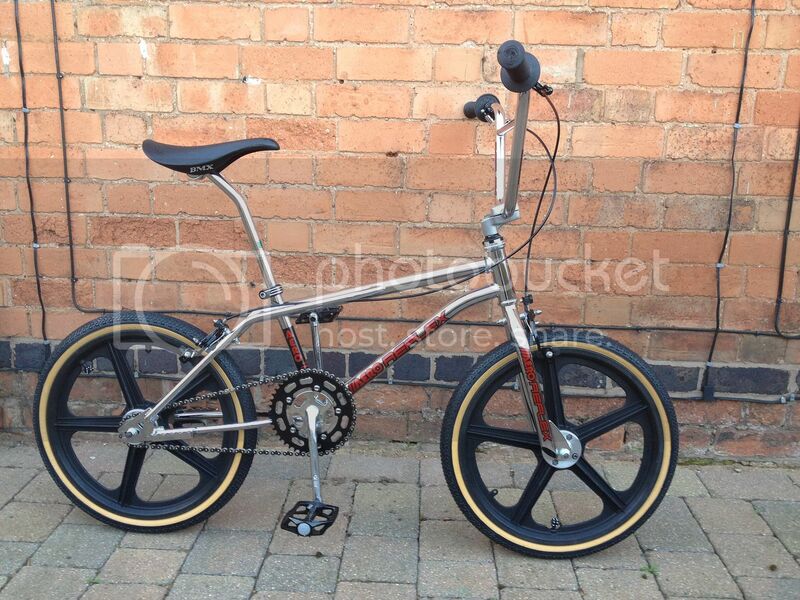 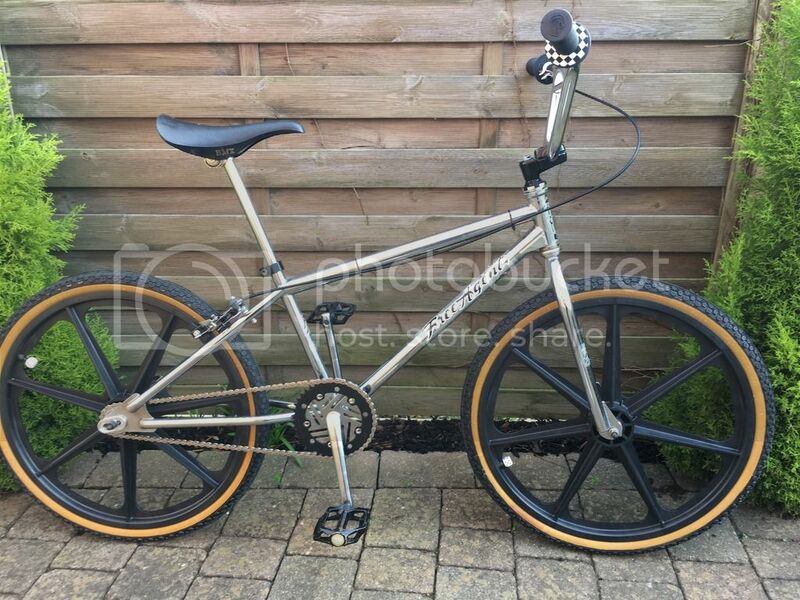 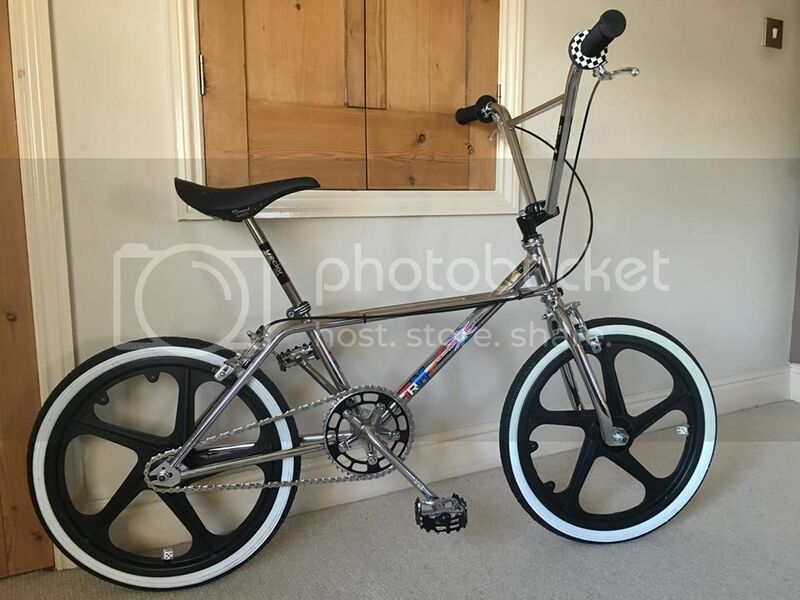 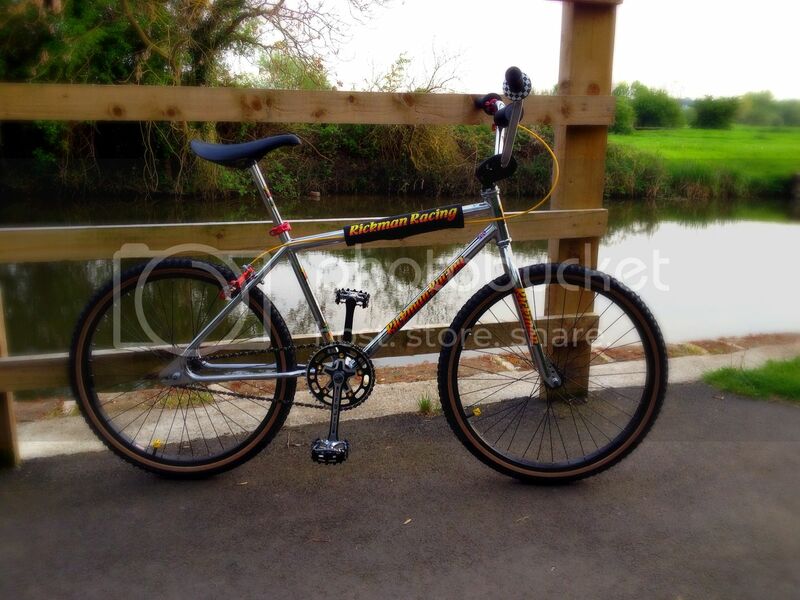 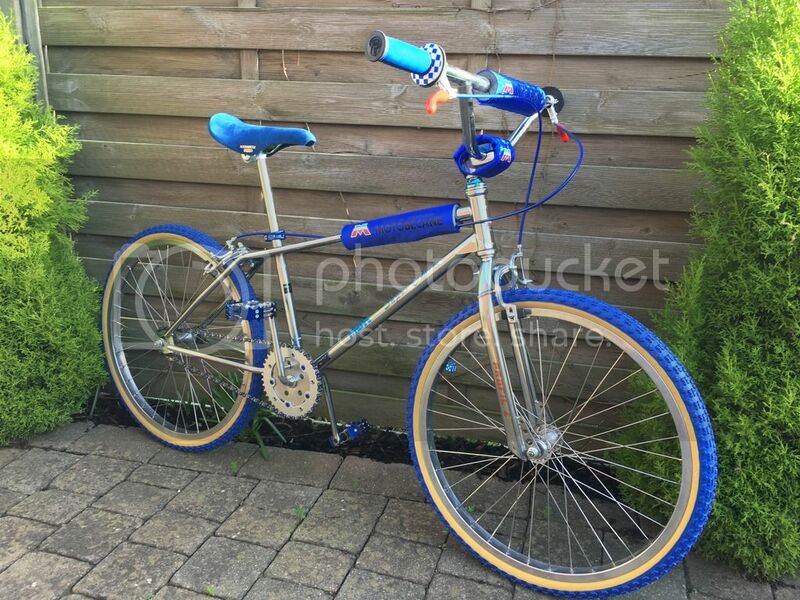 My Original 1984 Rickman Freestyler. 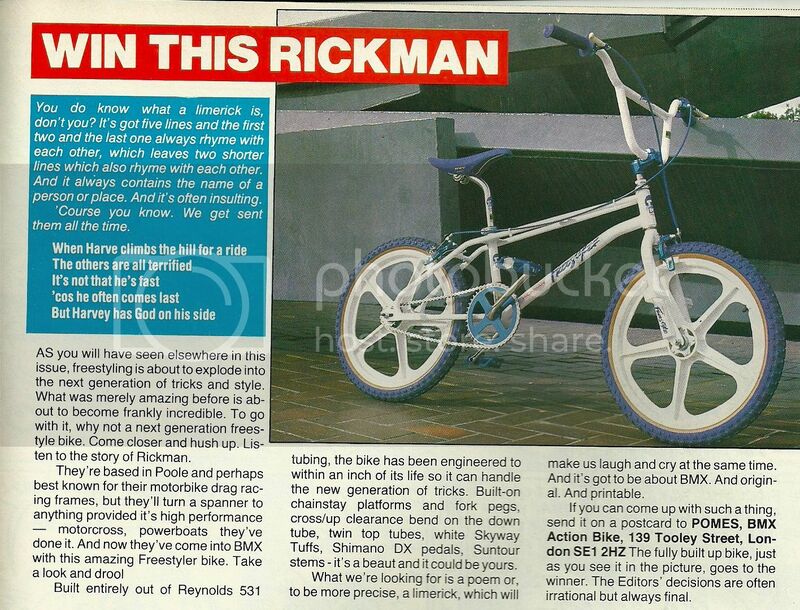 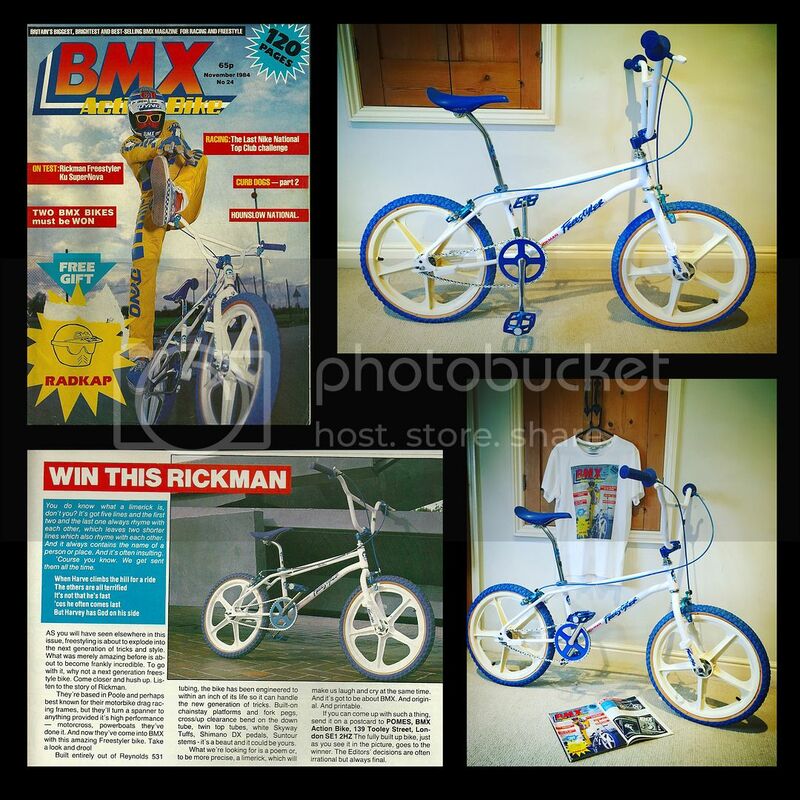 November 1984 Rickman Freestyler (BMX Action Bike Magazine) Test Bike Replica Build & Competition Bike. 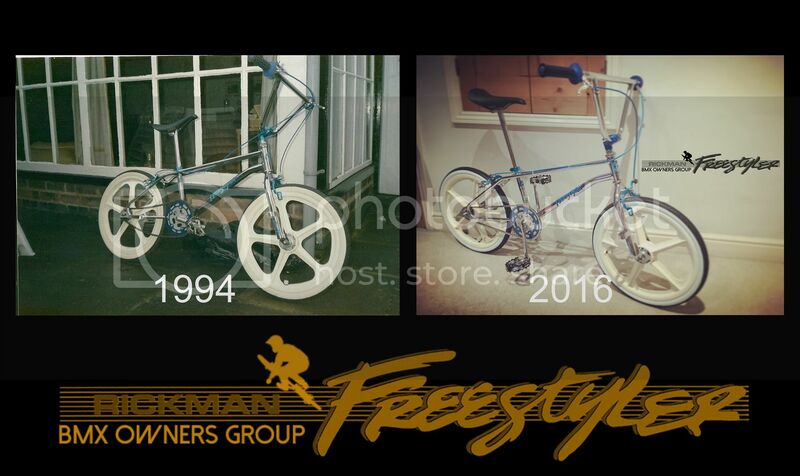 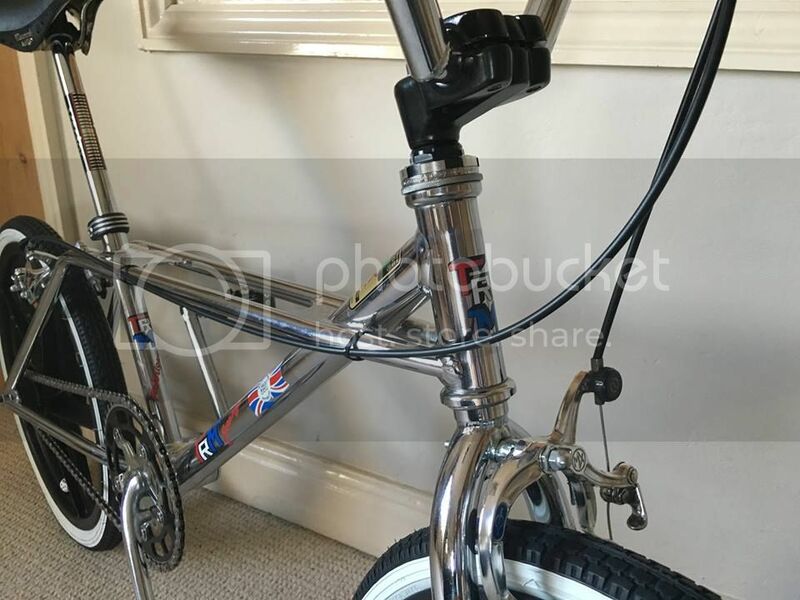 Minus the bar angle this is a replica of the Chrome Rickman Freestyler i had as a Kid built to the Spec the day i traded her in 1994. 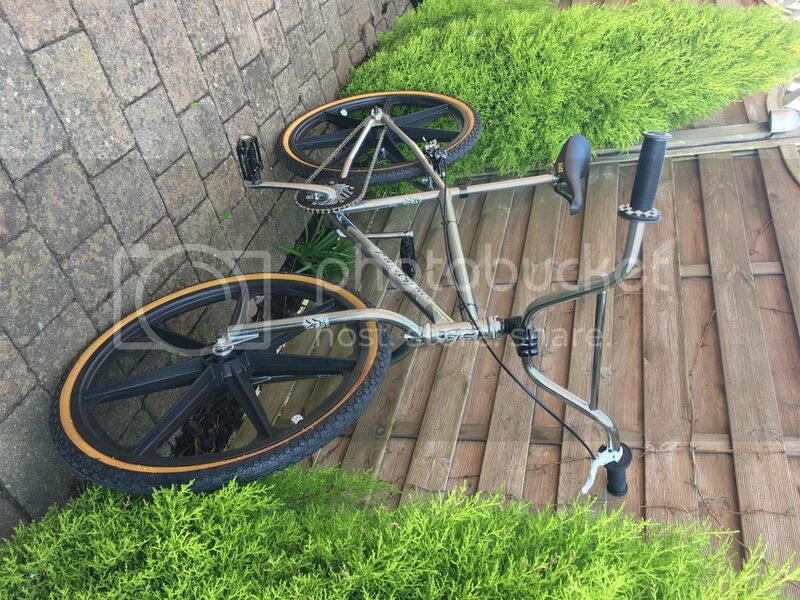 Not the Prettiest looking thing but something i had to build. 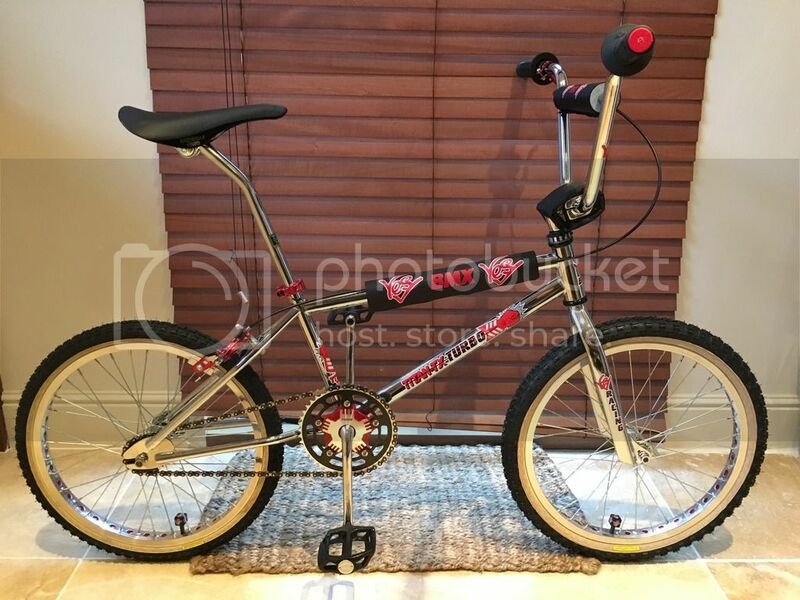 My Survivor Chrome Rider TRM Freestyler ! 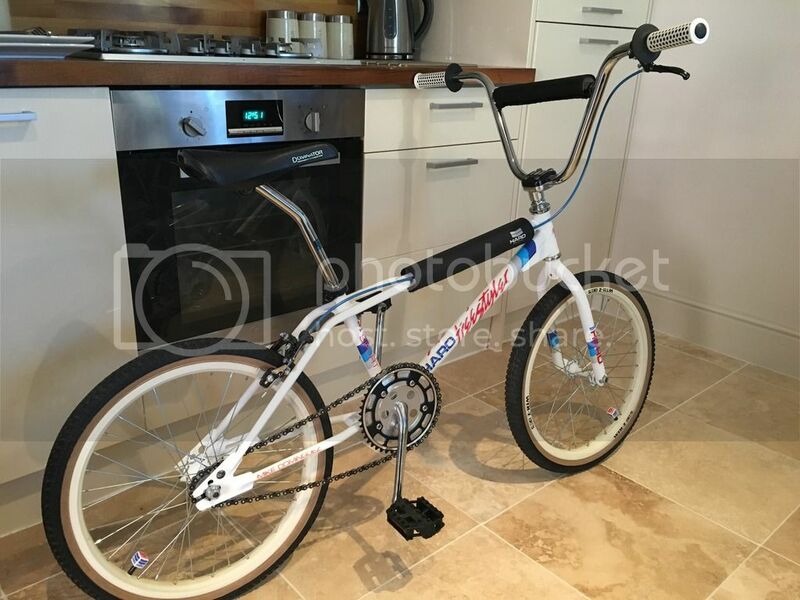 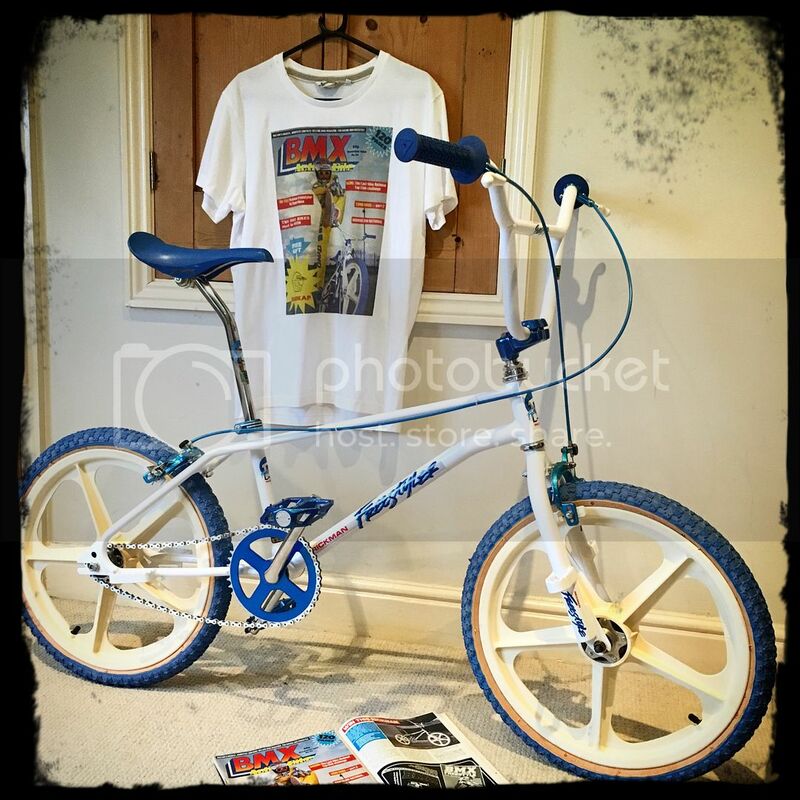 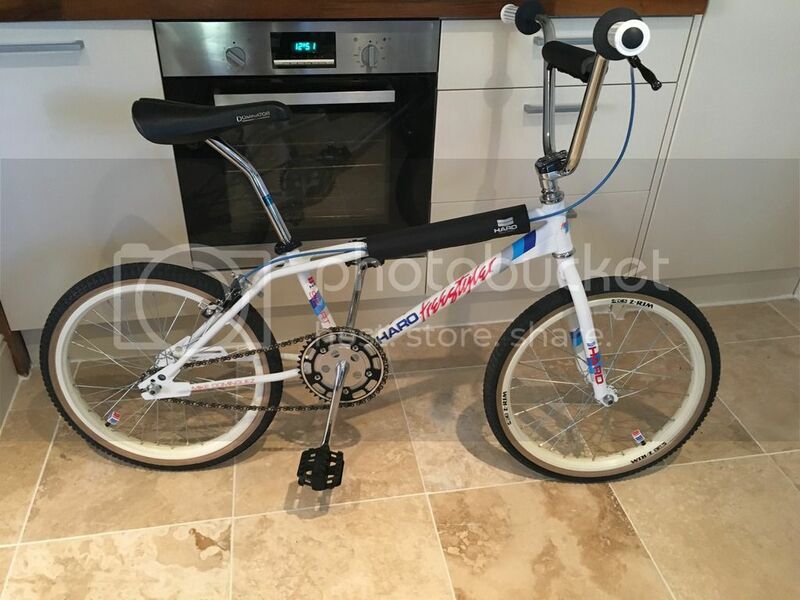 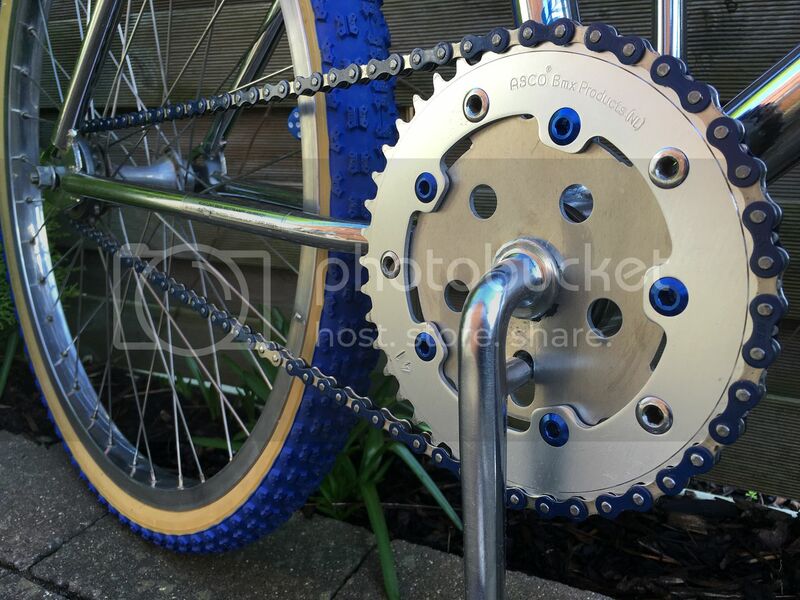 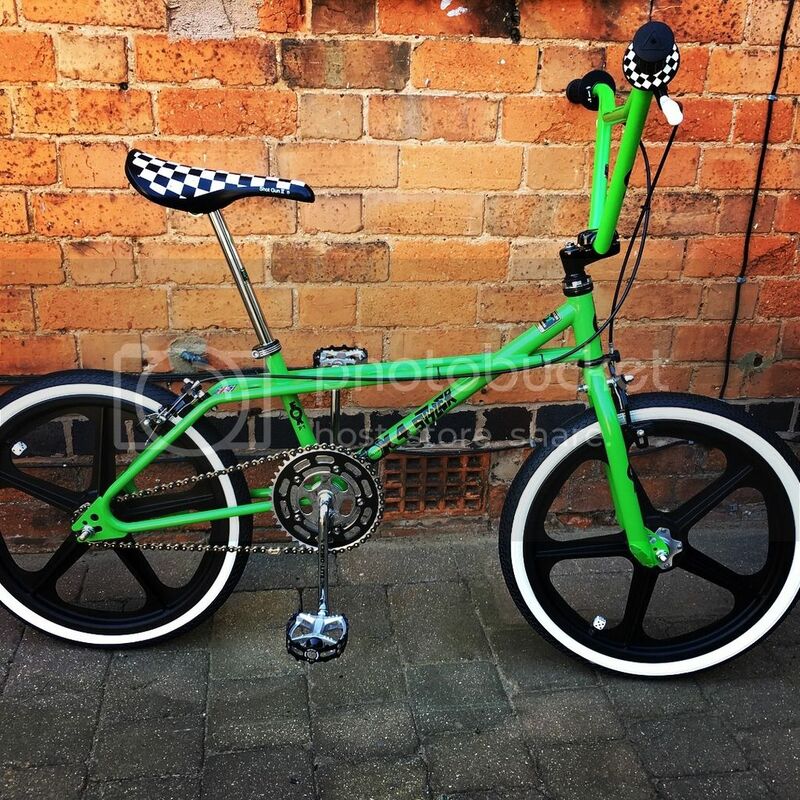 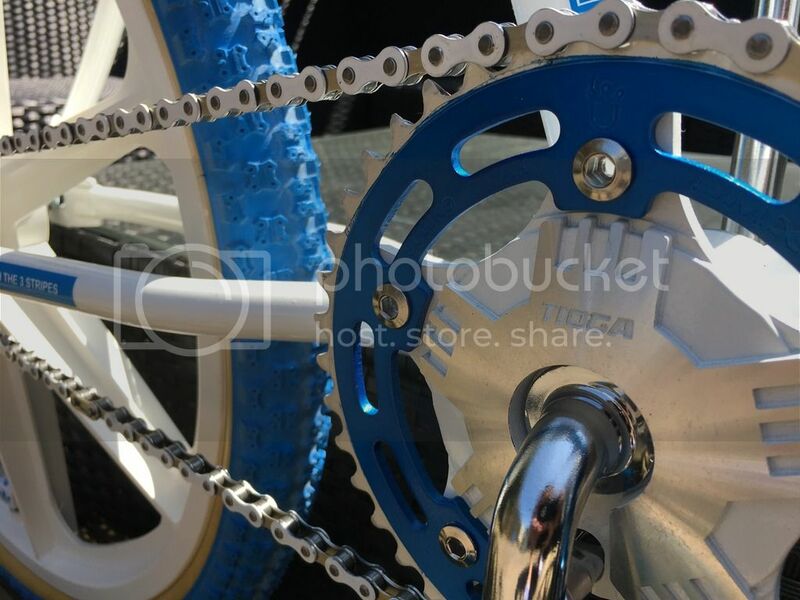 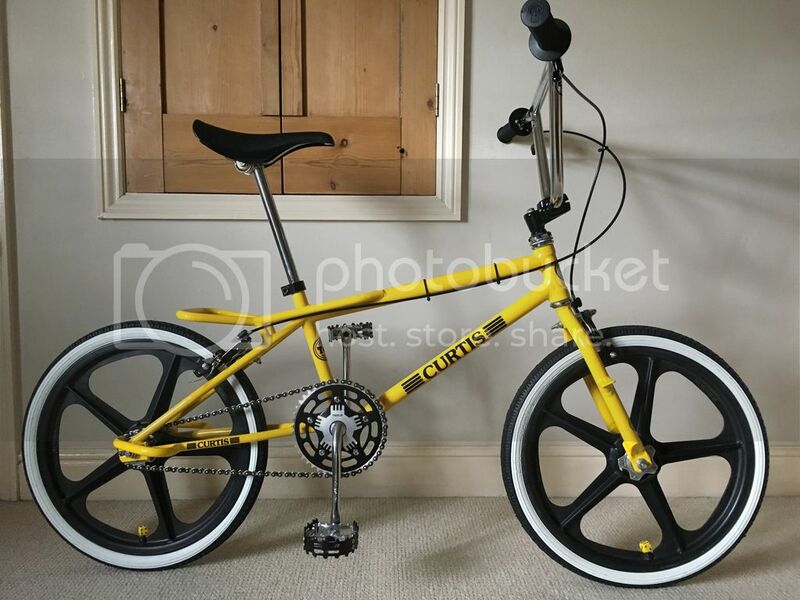 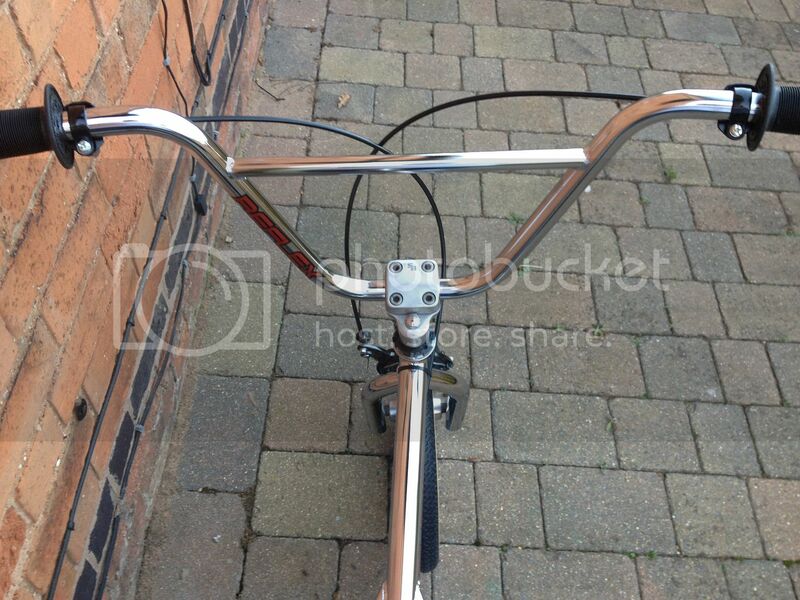 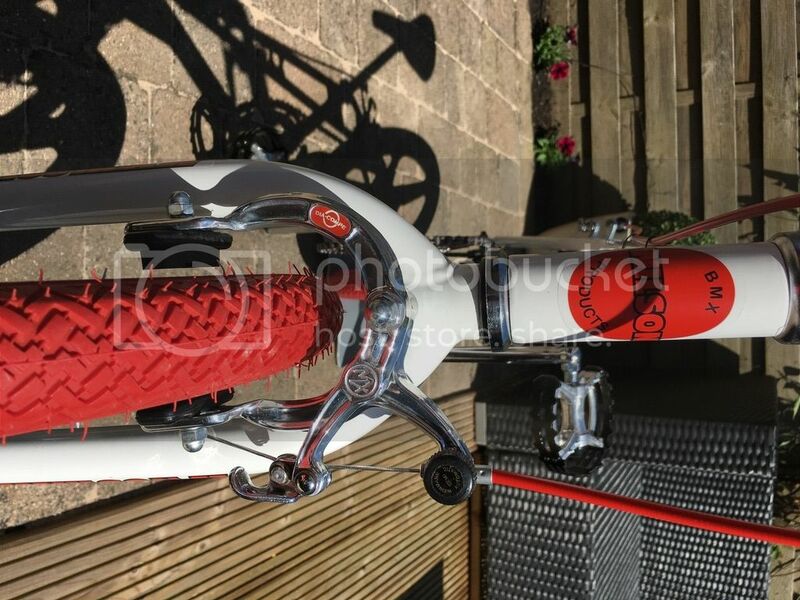 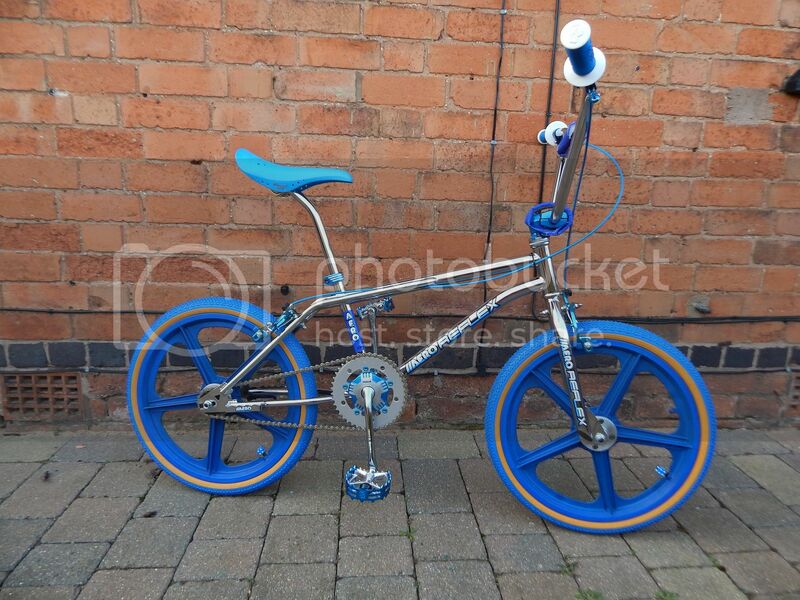 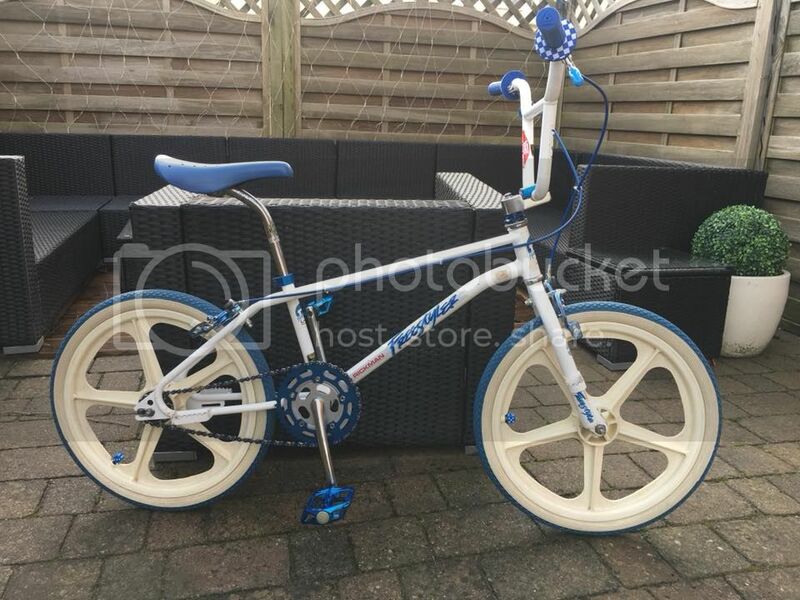 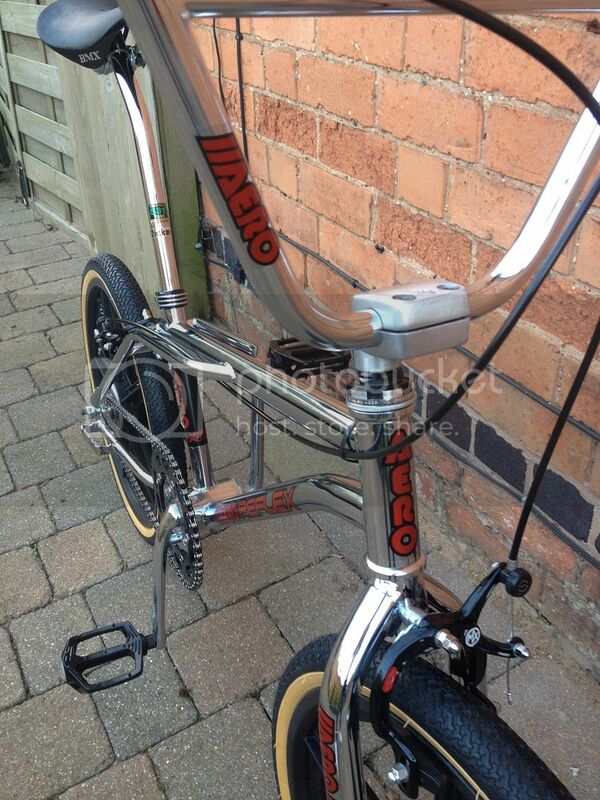 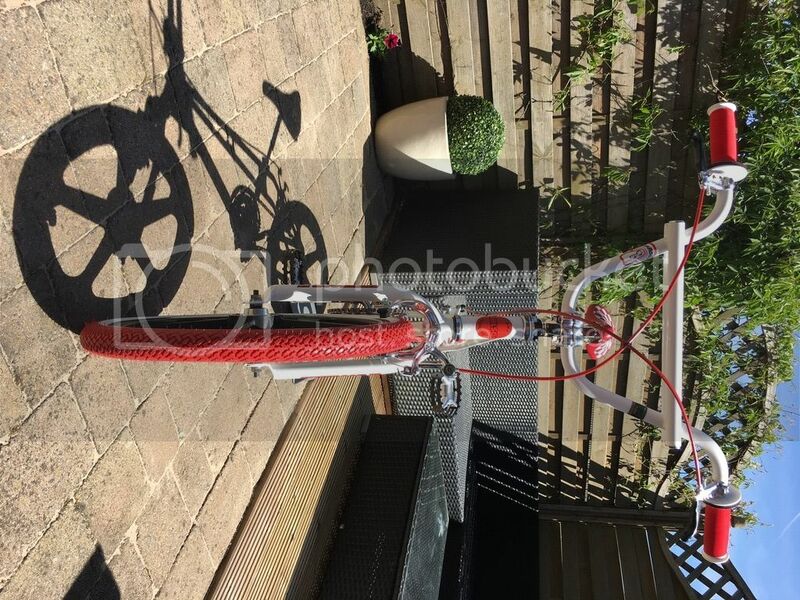 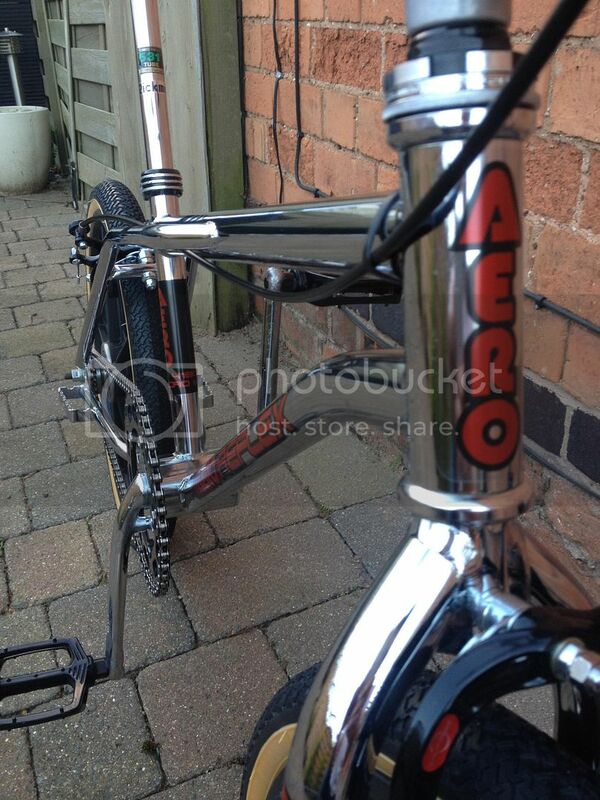 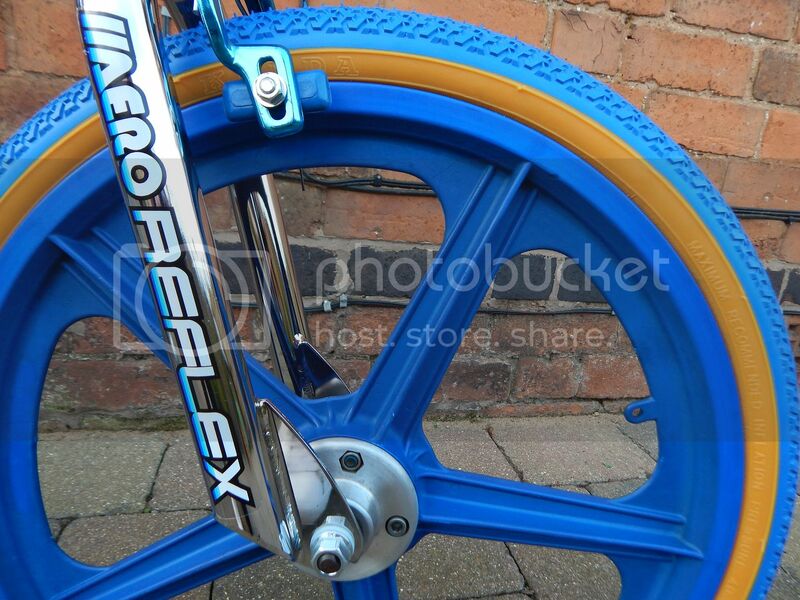 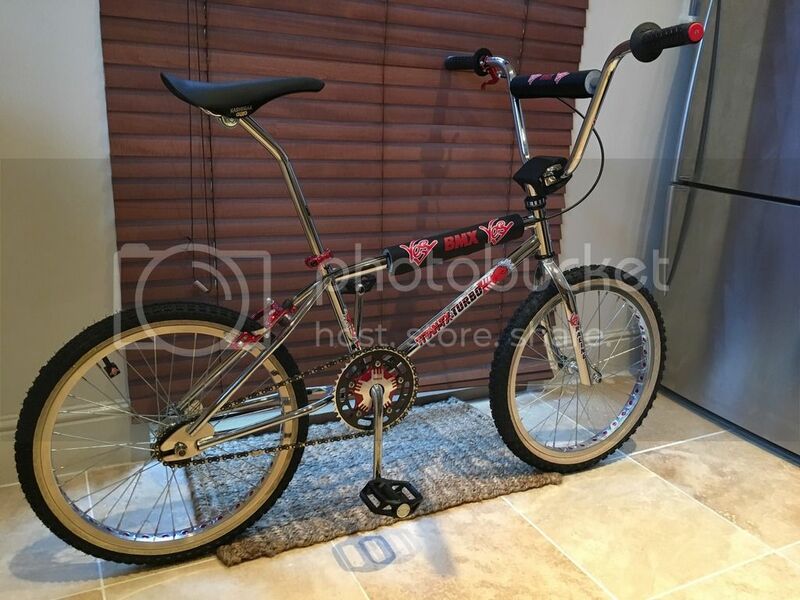 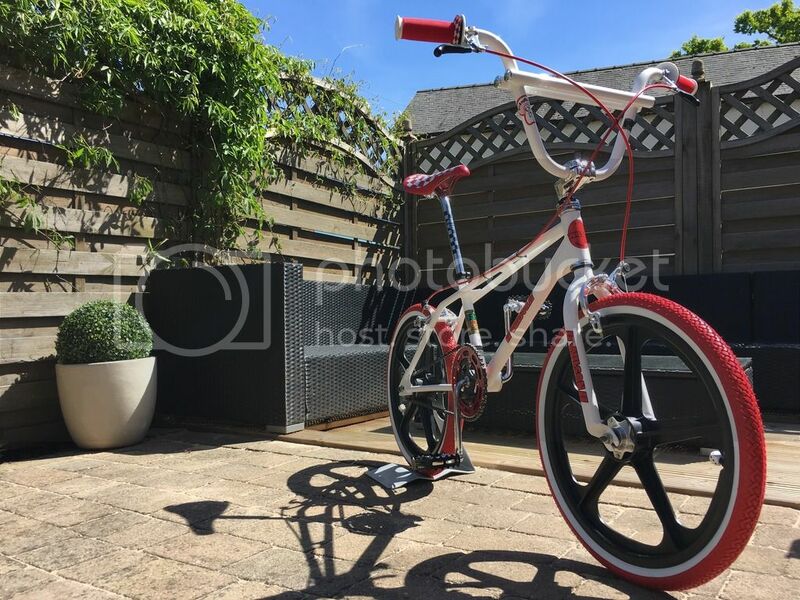 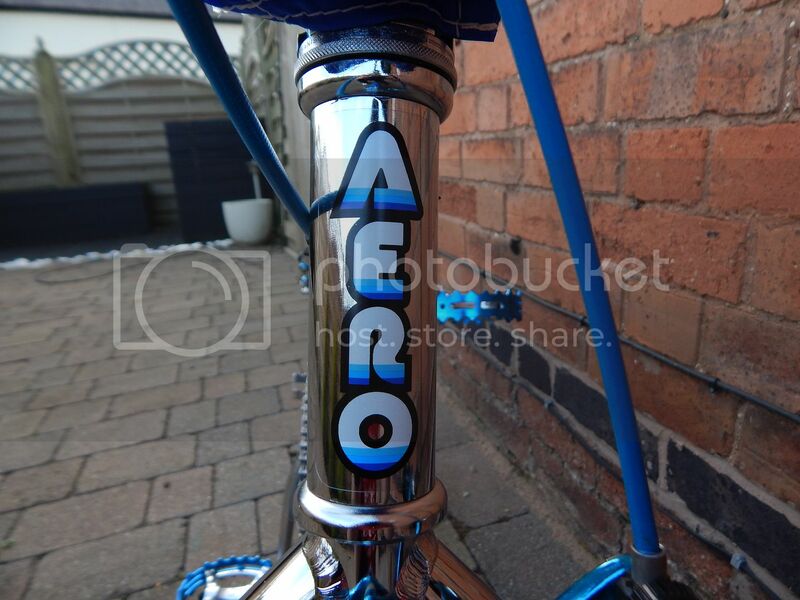 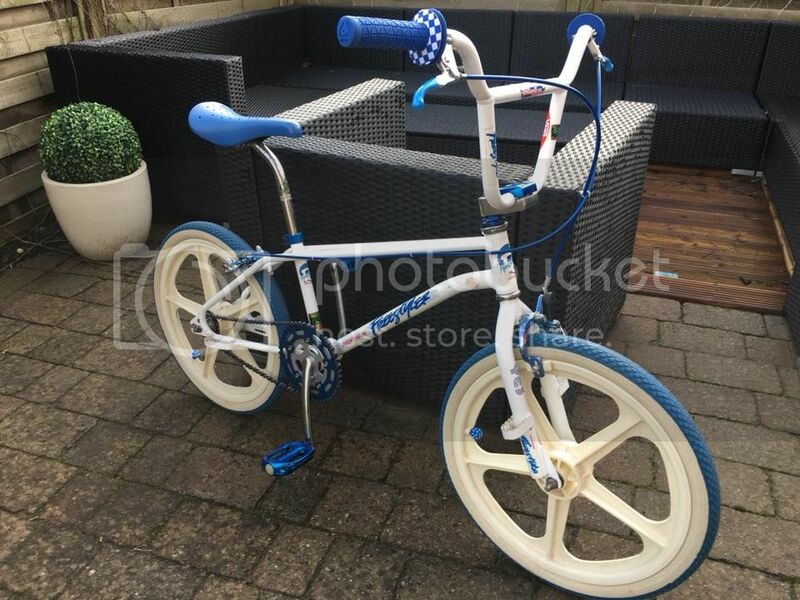 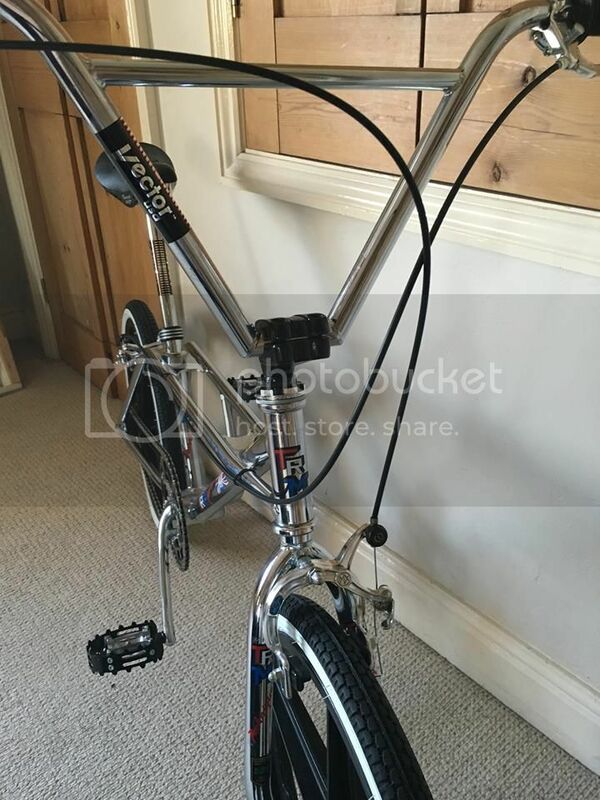 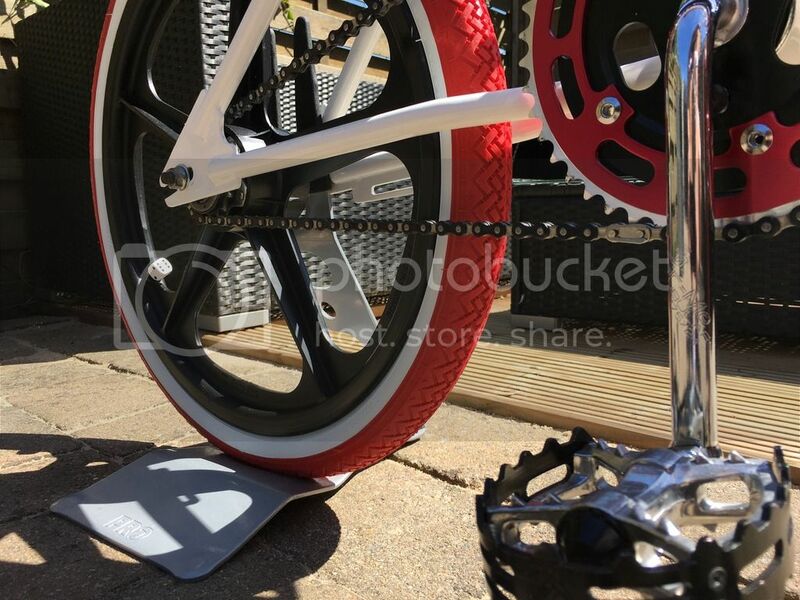 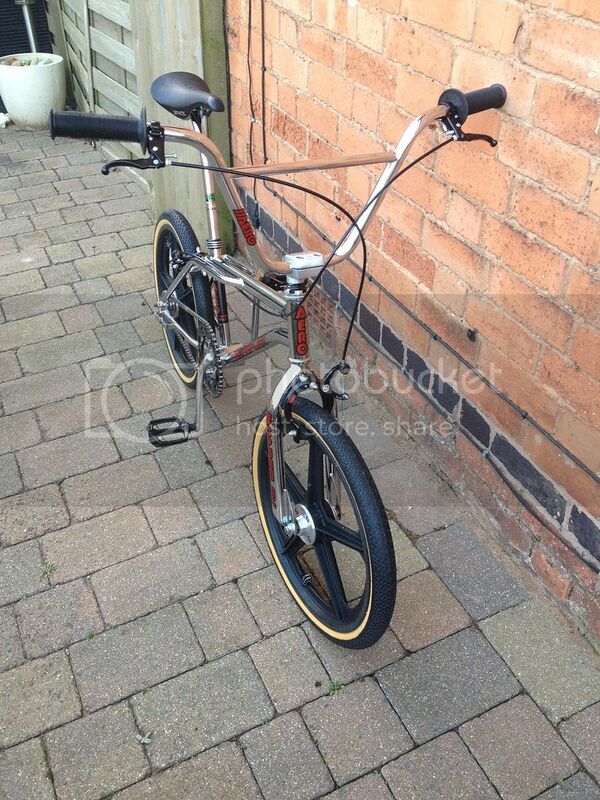 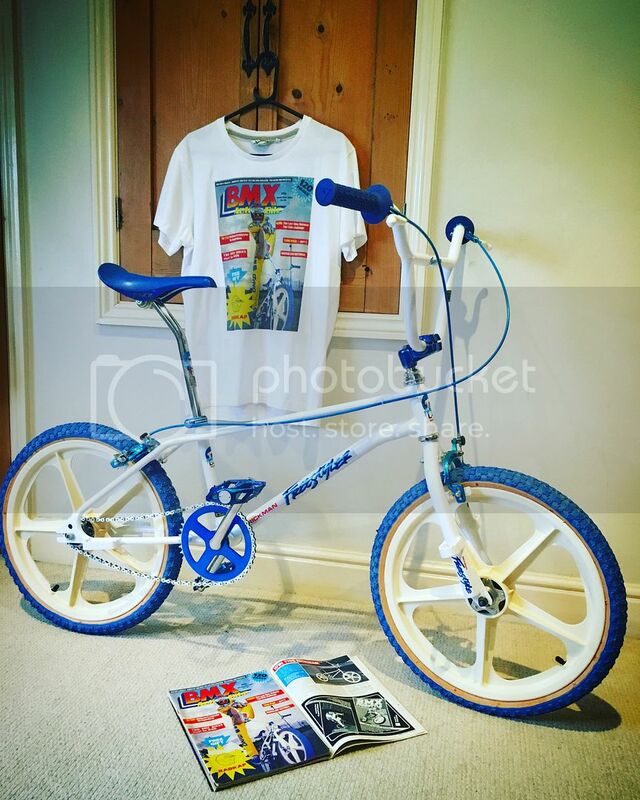 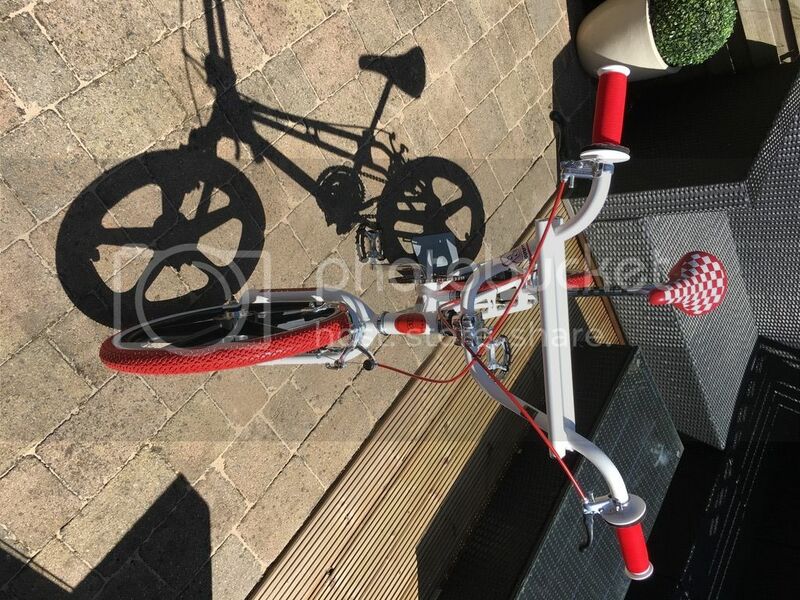 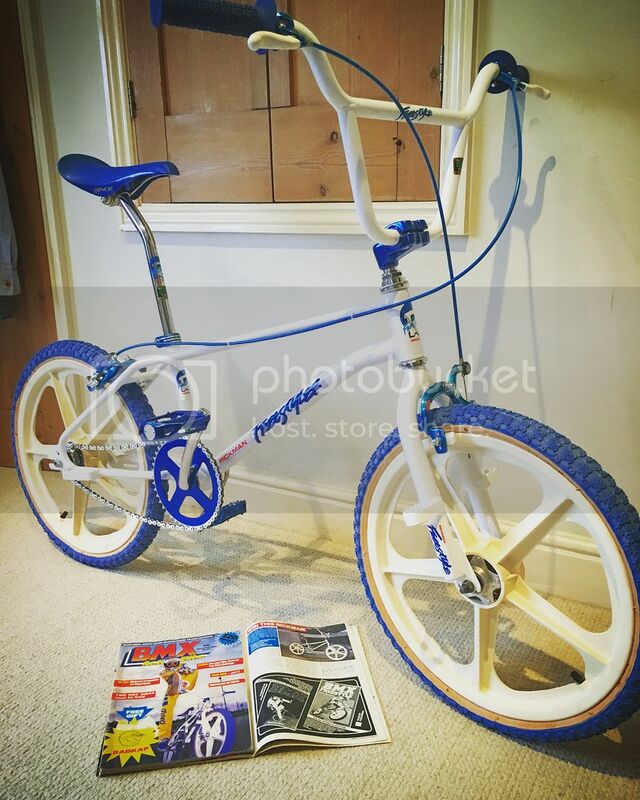 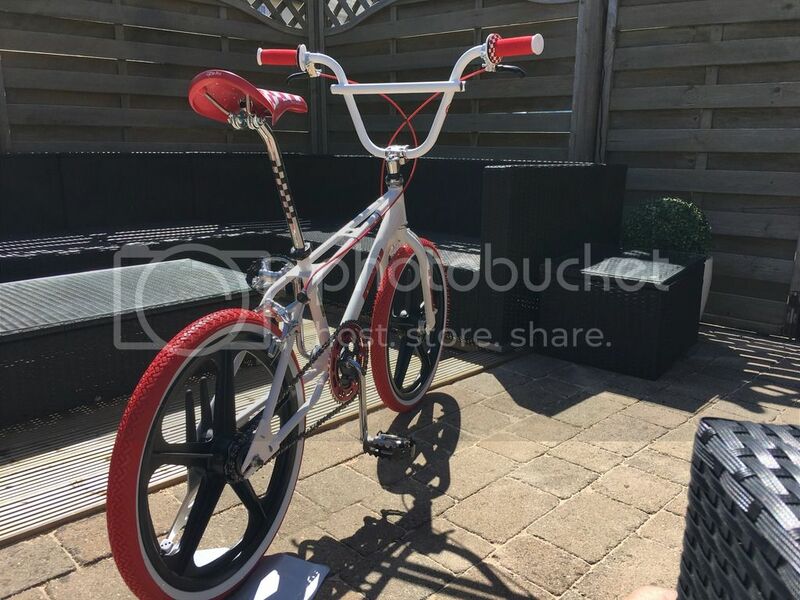 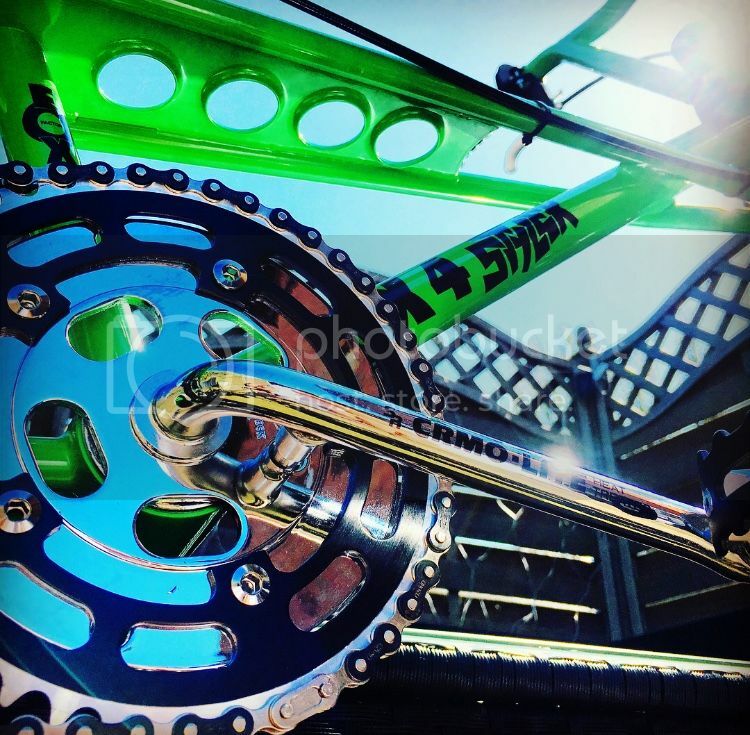 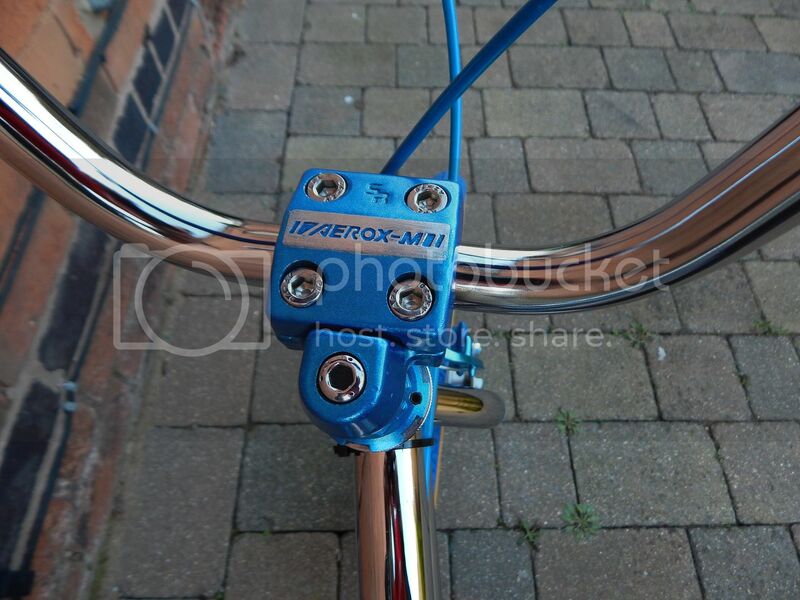 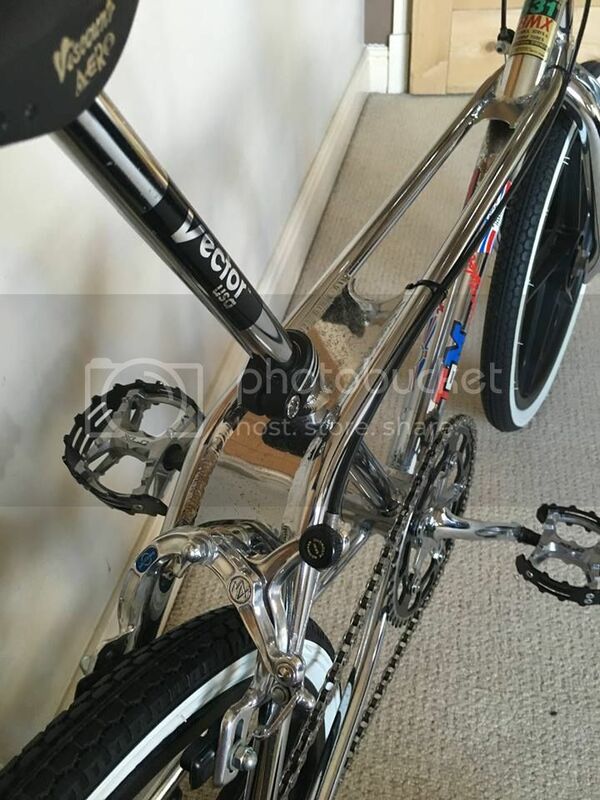 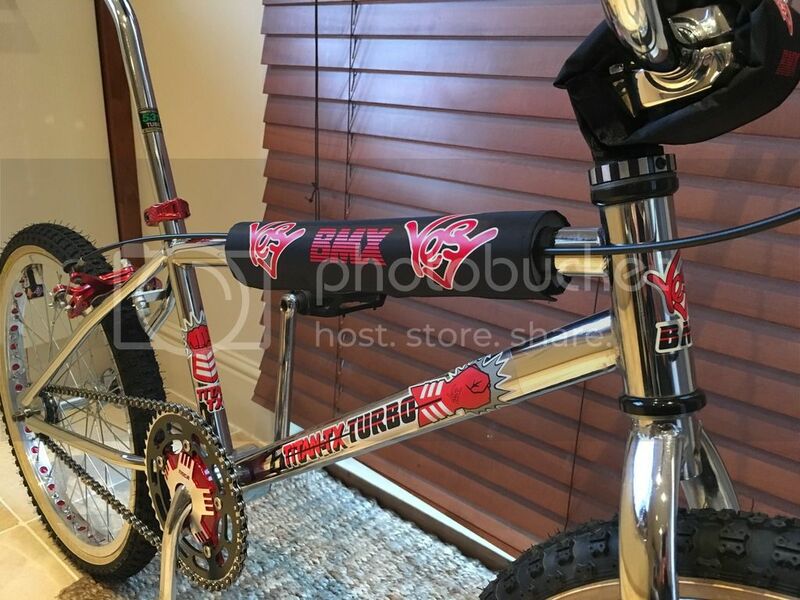 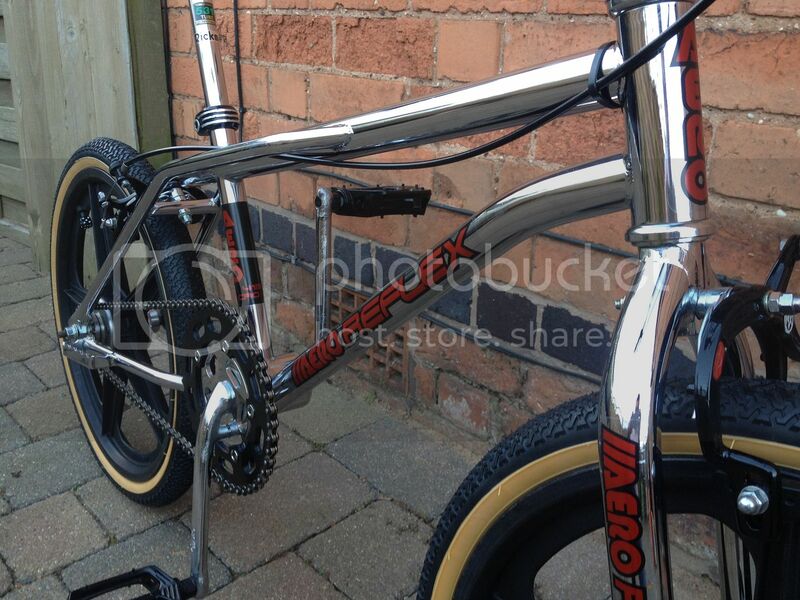 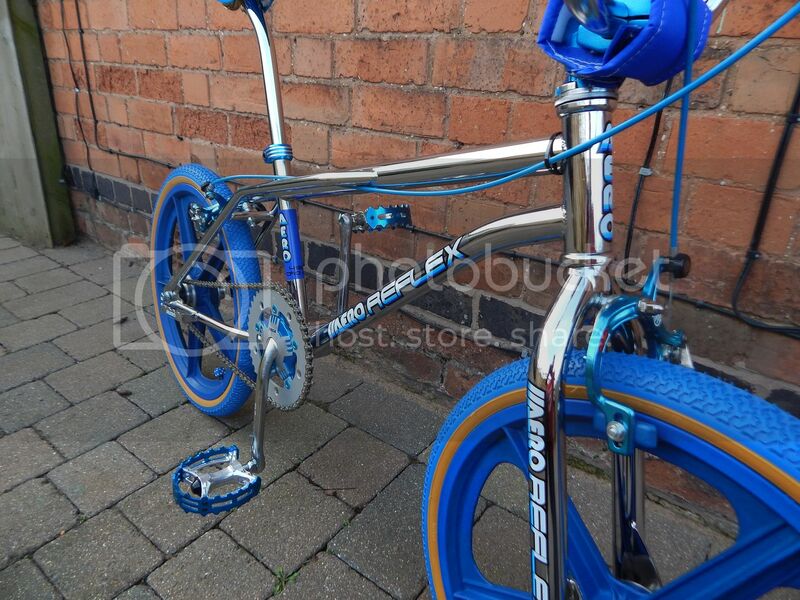 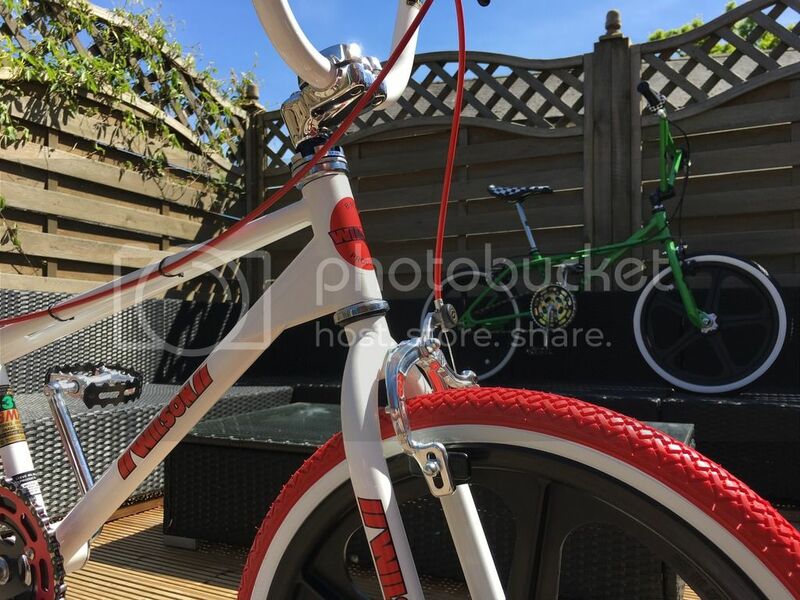 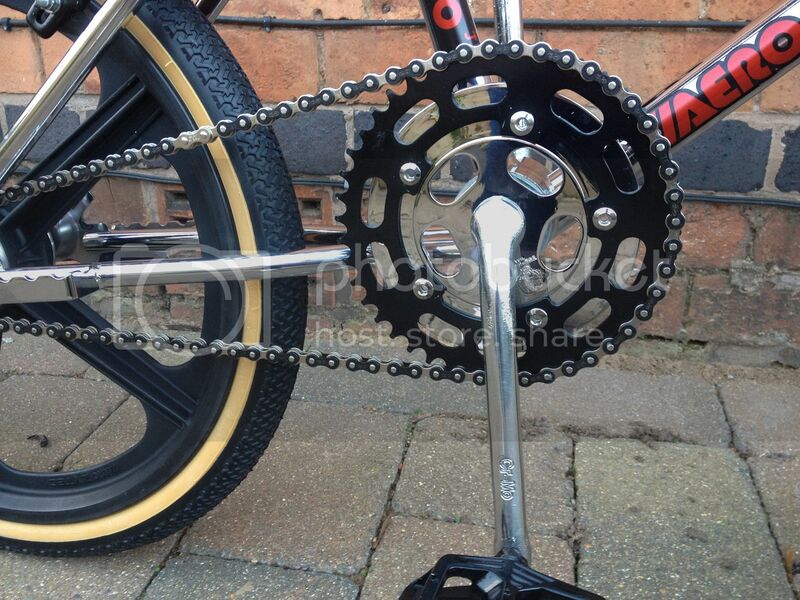 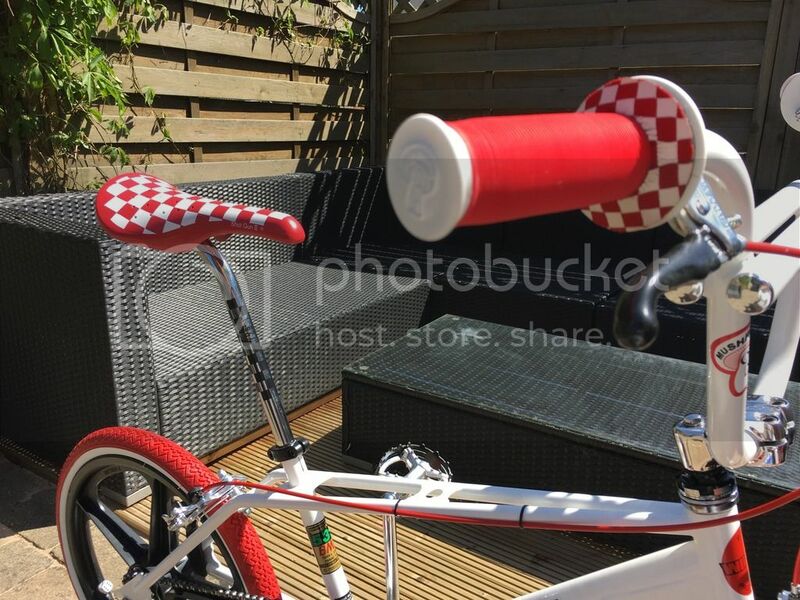 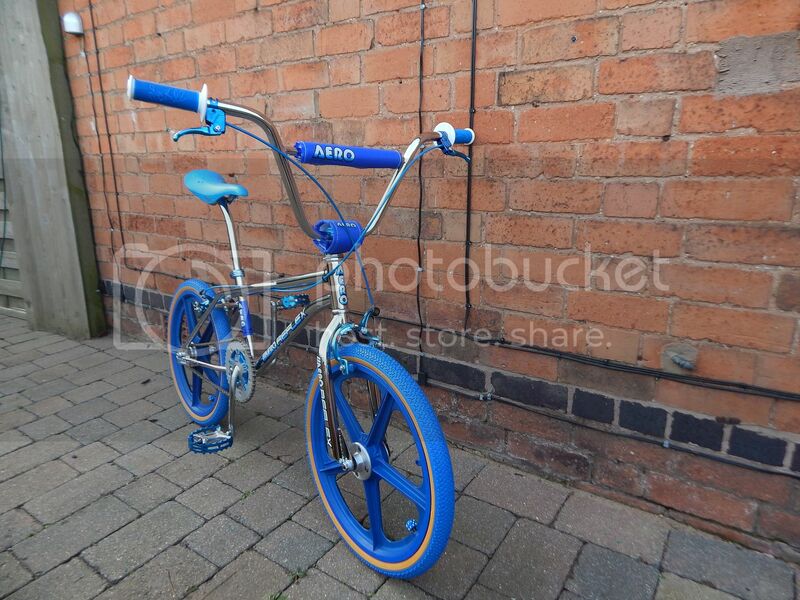 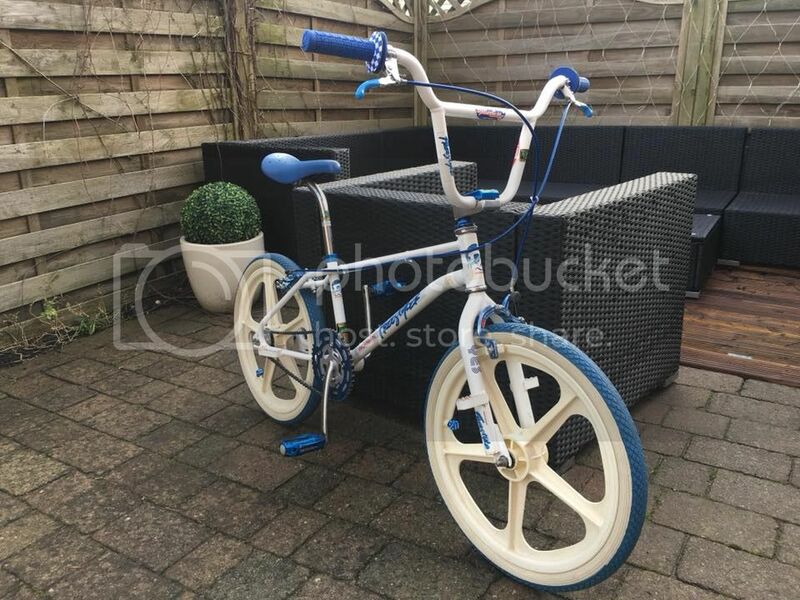 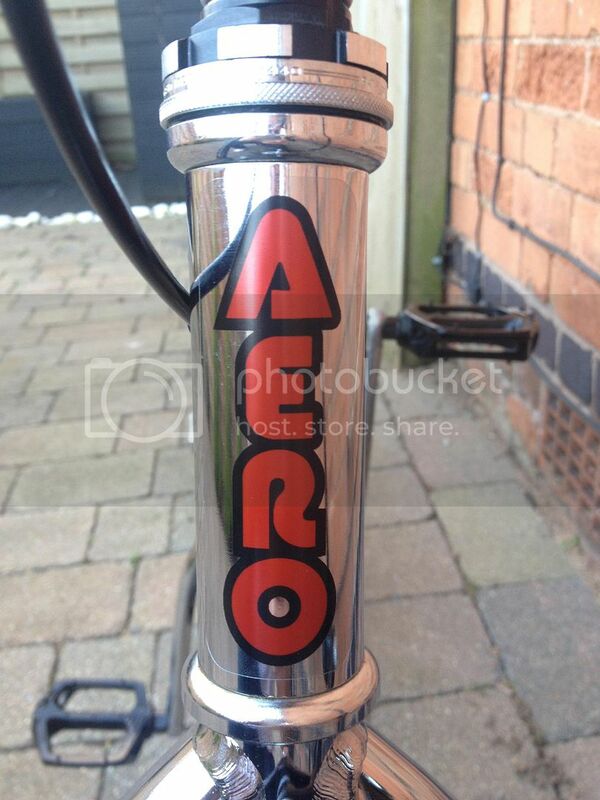 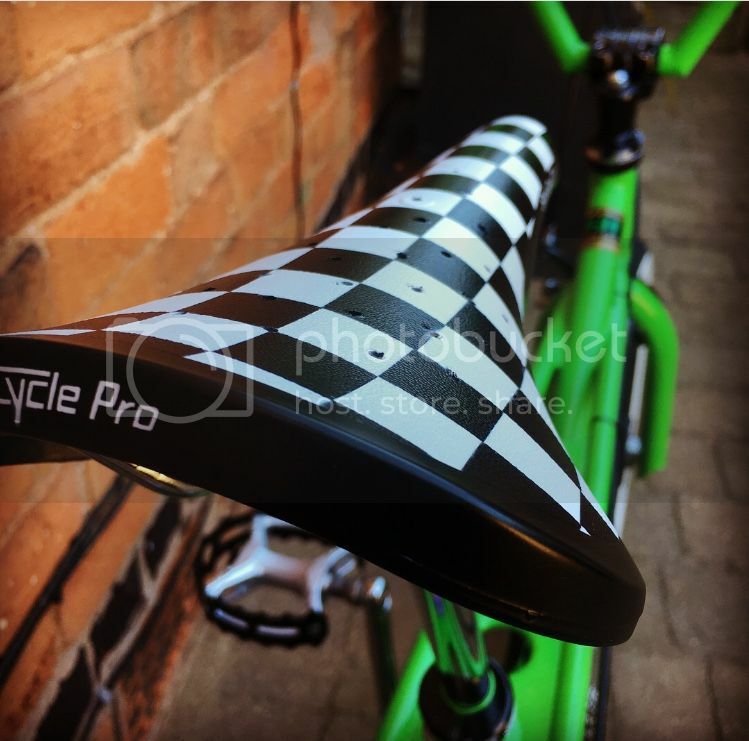 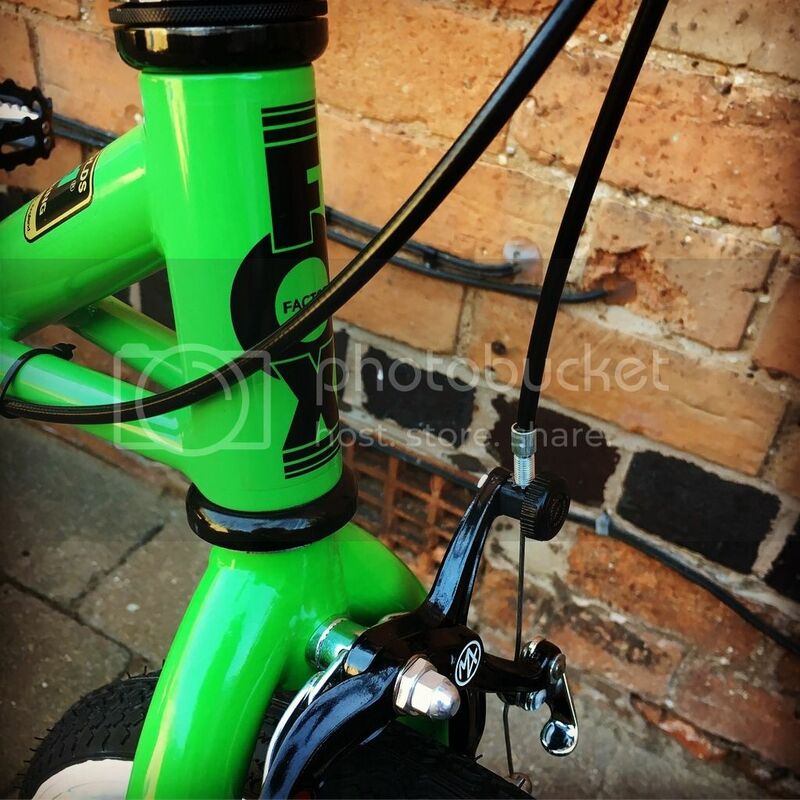 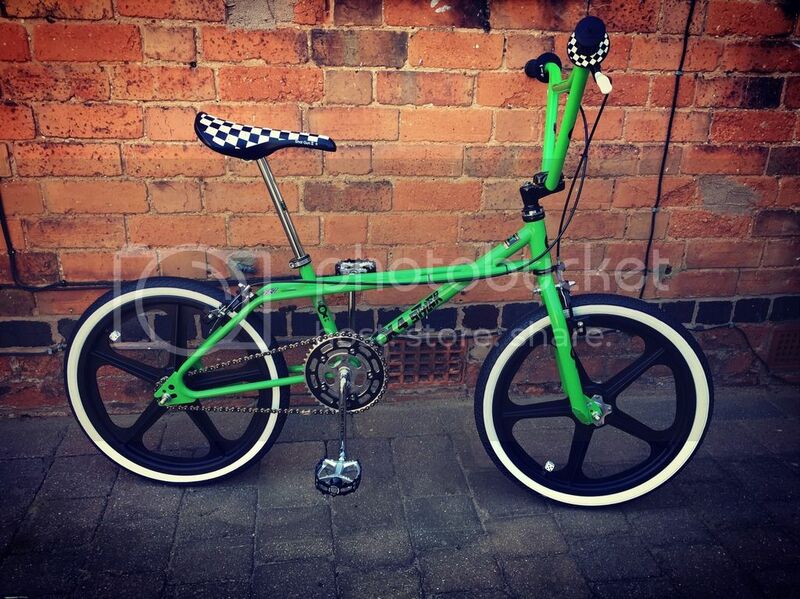 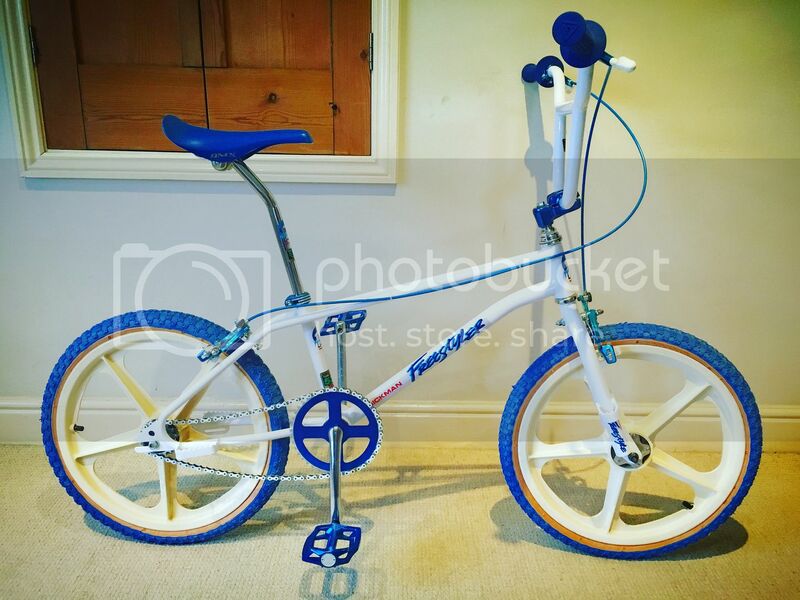 Quite a classic combo for a Curtis Freestyler & a twist on the Freestyle BMX magazine test bike . 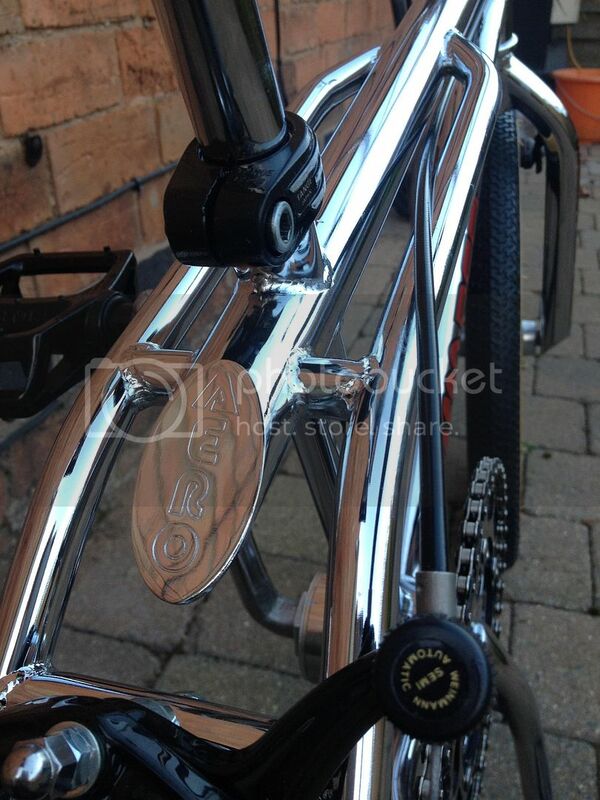 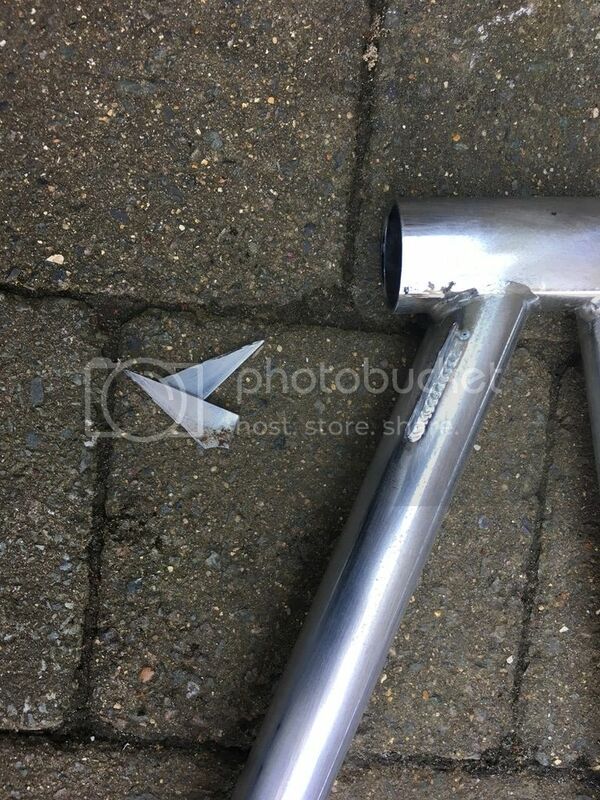 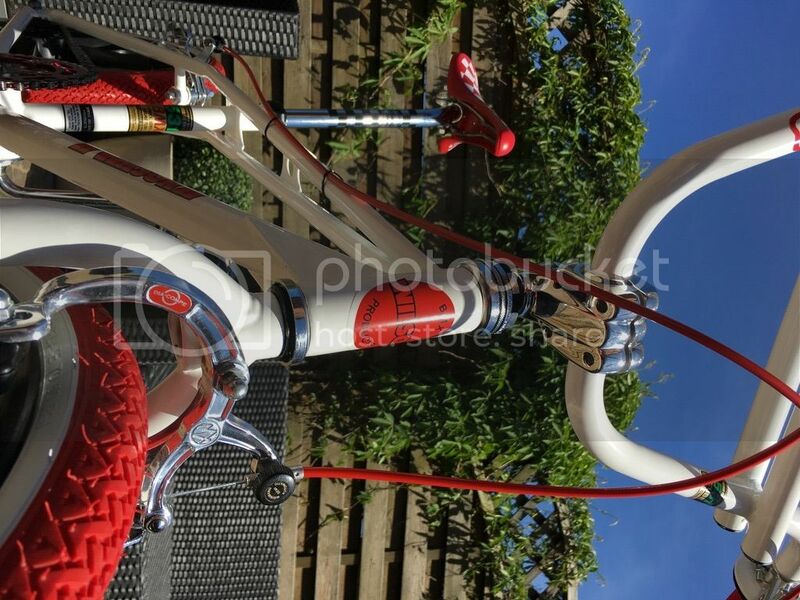 Chrome is bright & the frame is straight & true features a Unique Single in to Double Top Tube . 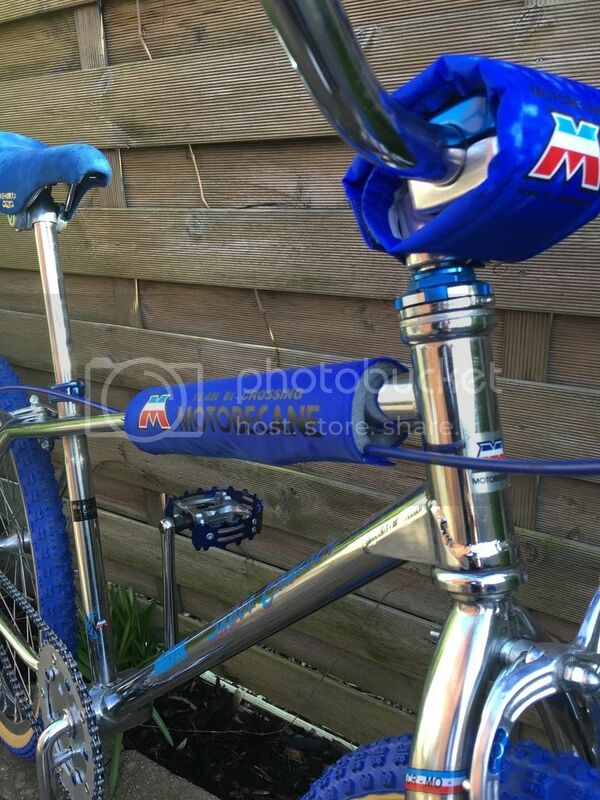 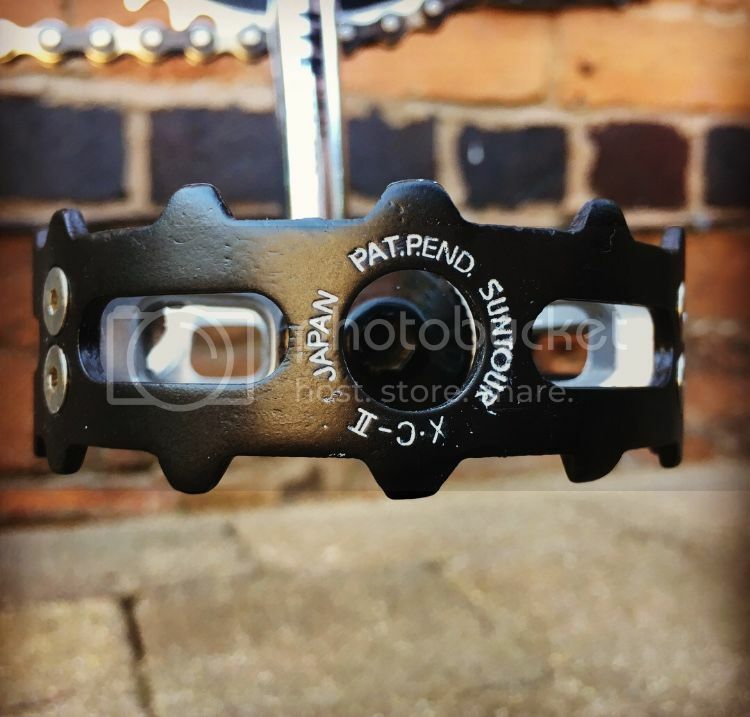 NOS MX Seat Post Clamp . 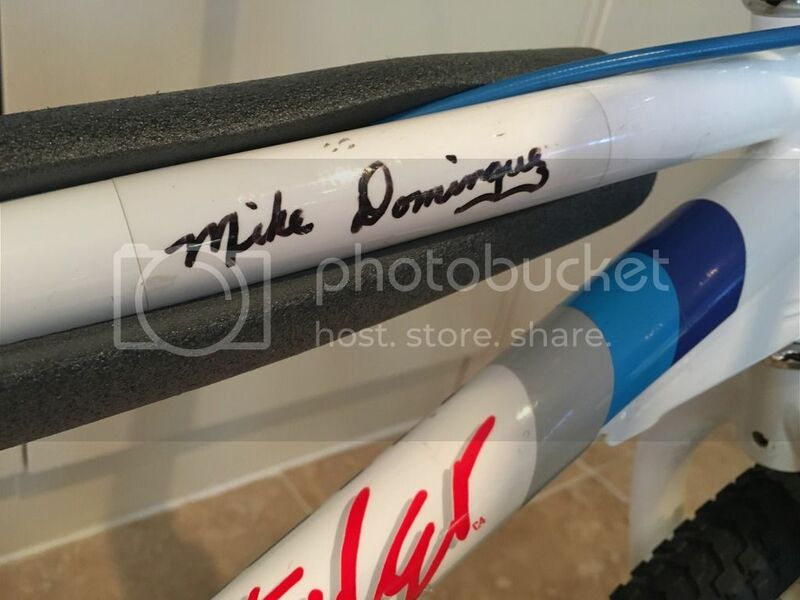 1986 Haro Sport Signed by Mike D.
This frame & fork set was previously owned by Mike Miranda who raced this even though he was with the team 2 years later as he preferred the slightly bigger frame of the 86. 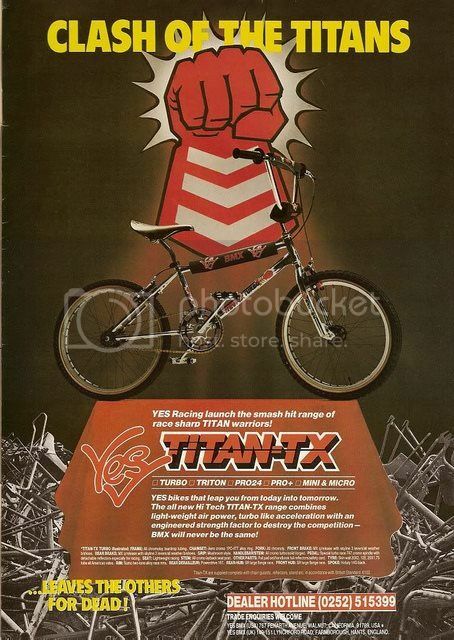 It was purchased on Craig's list in the California directly from him & there's a thread about it on the museum here..
1984 Yes Titan TX Turbo. 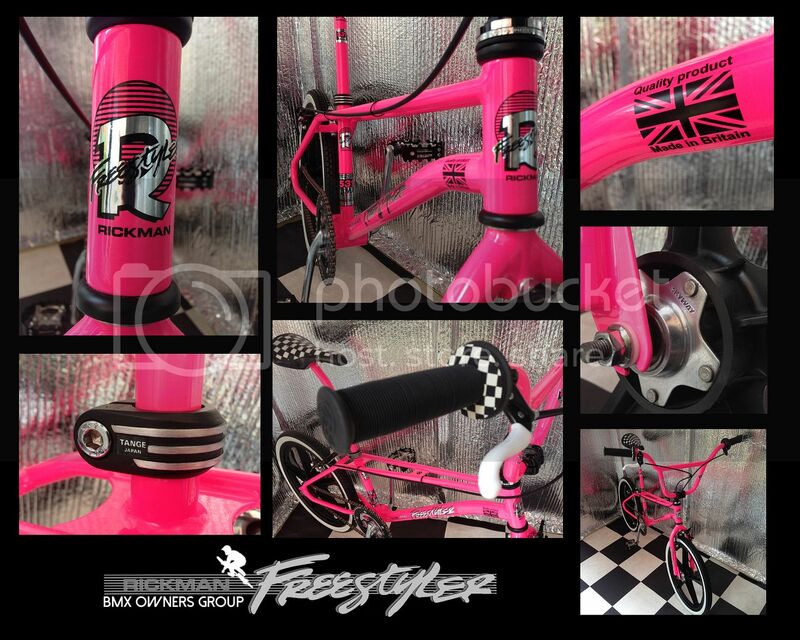 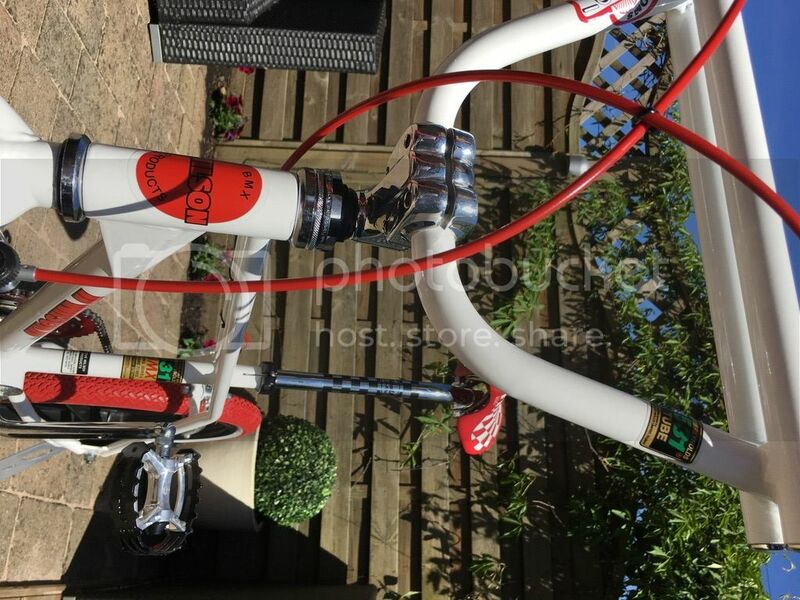 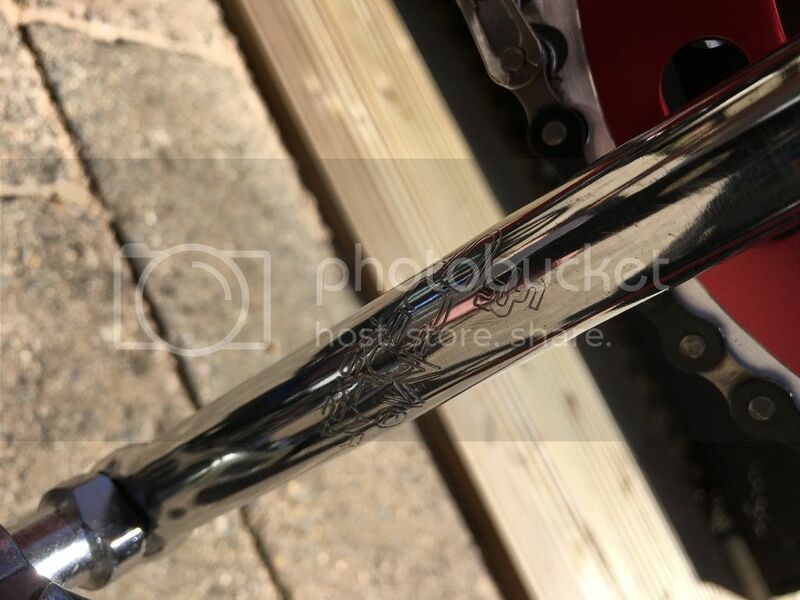 Bars: Nos Tioga freestyle with new bar ends as i broke the others taking them off for paint. 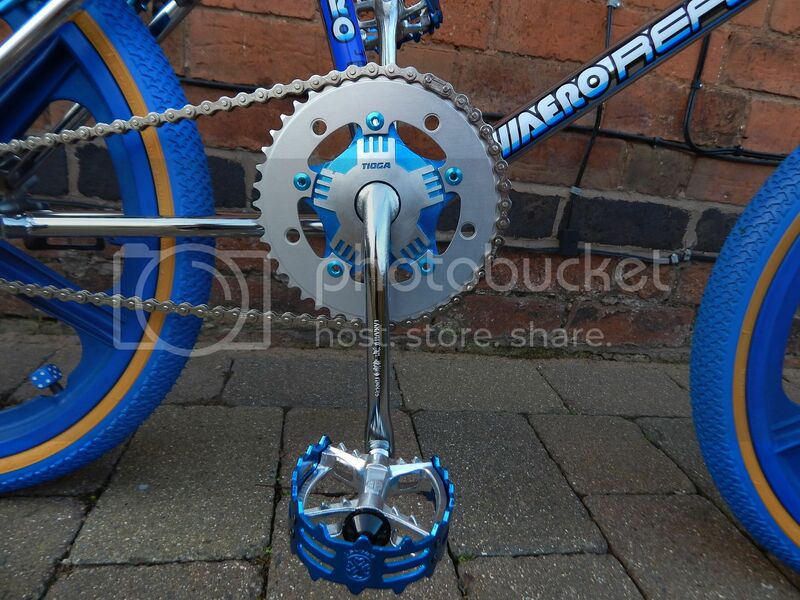 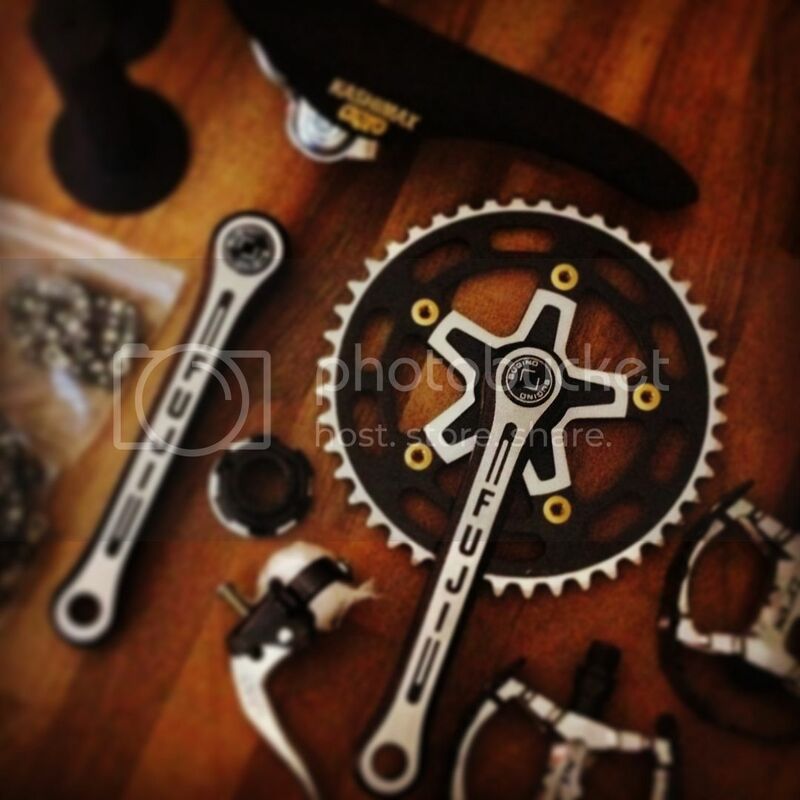 Clamp : Dia Compe twin Bolt. 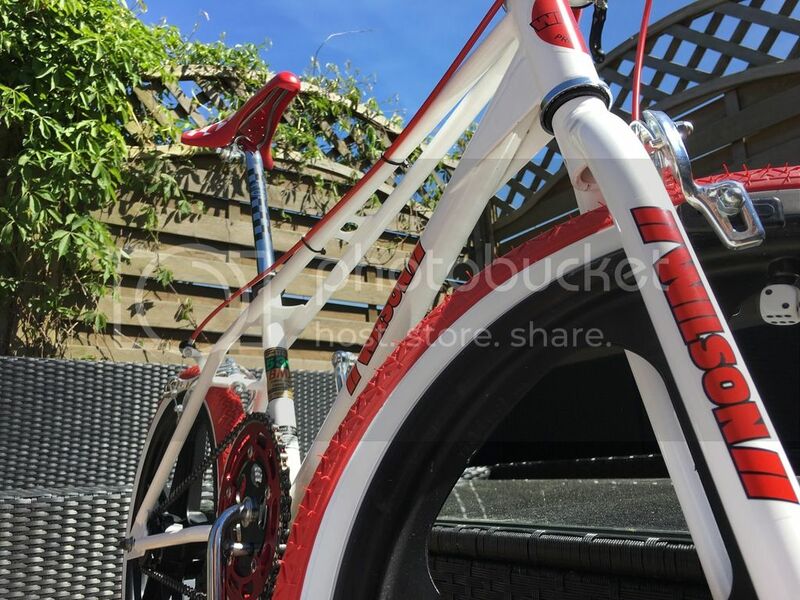 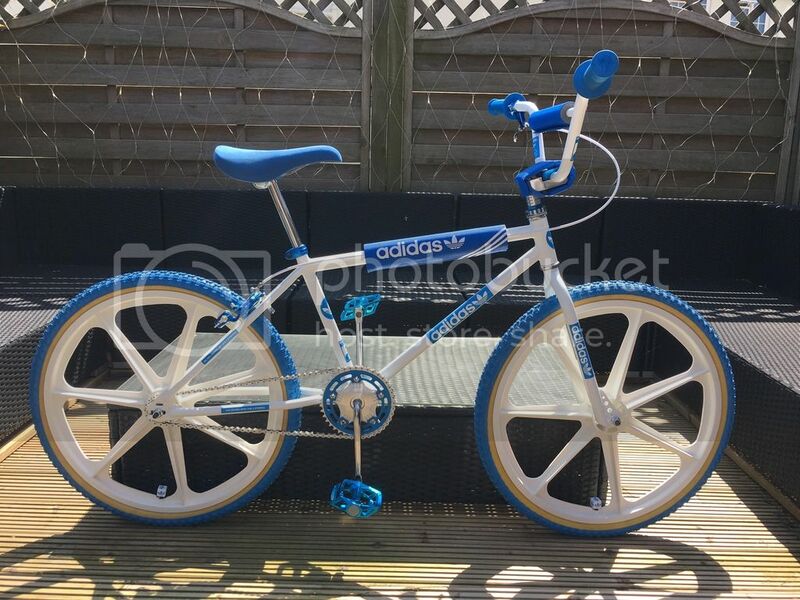 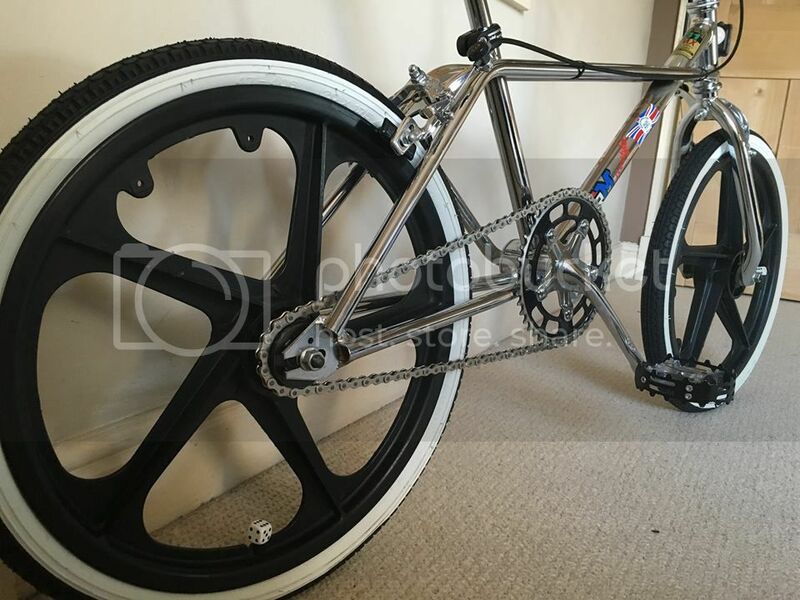 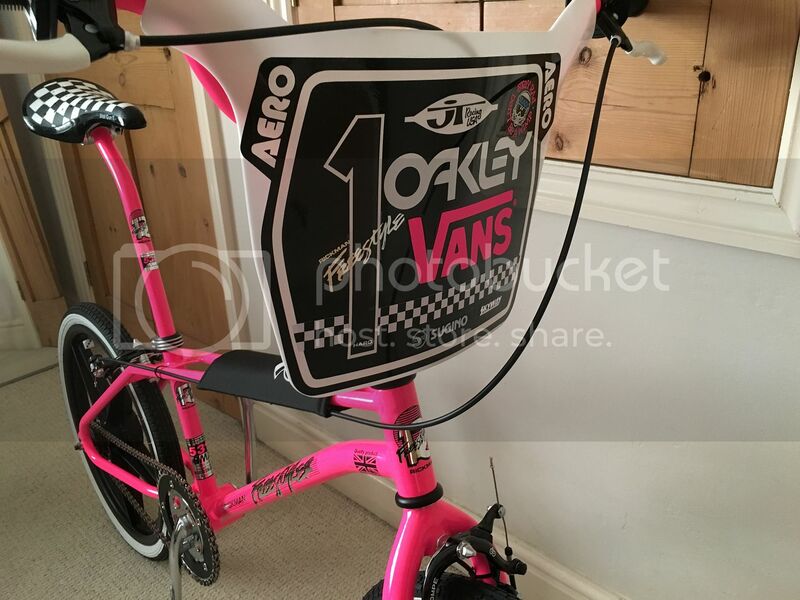 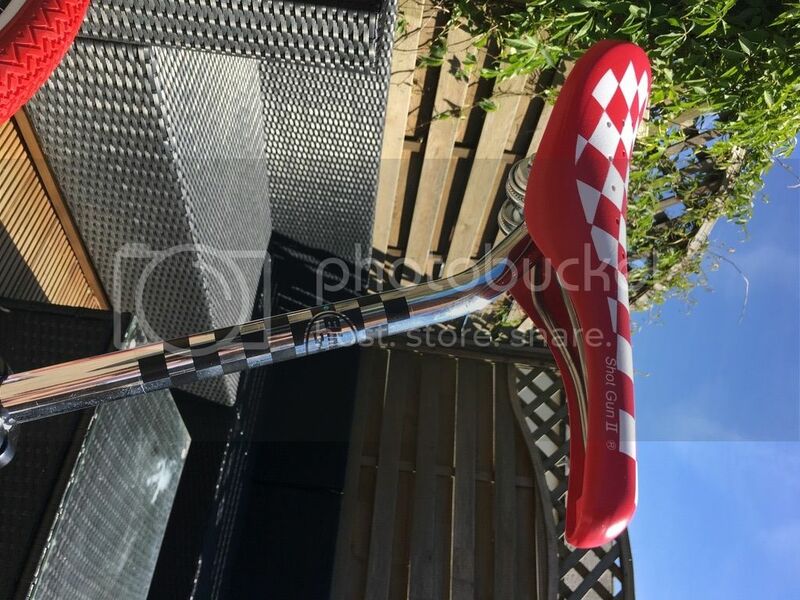 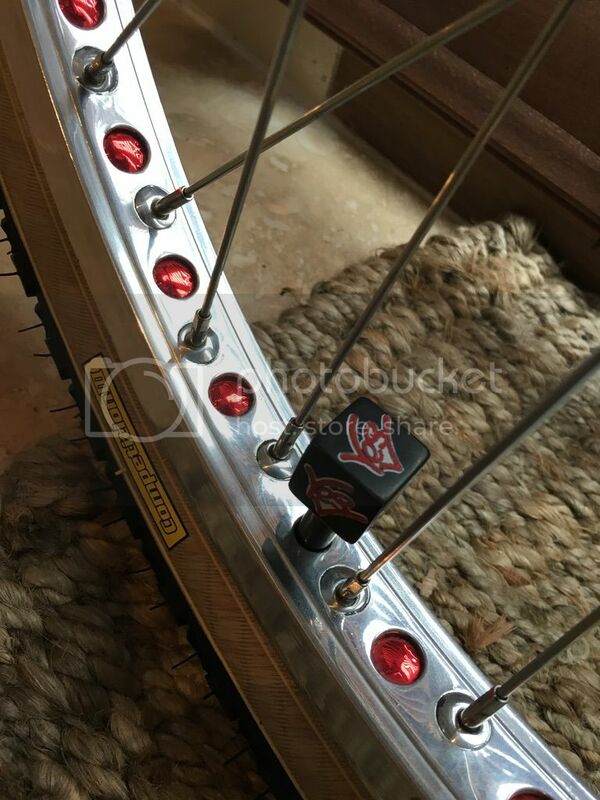 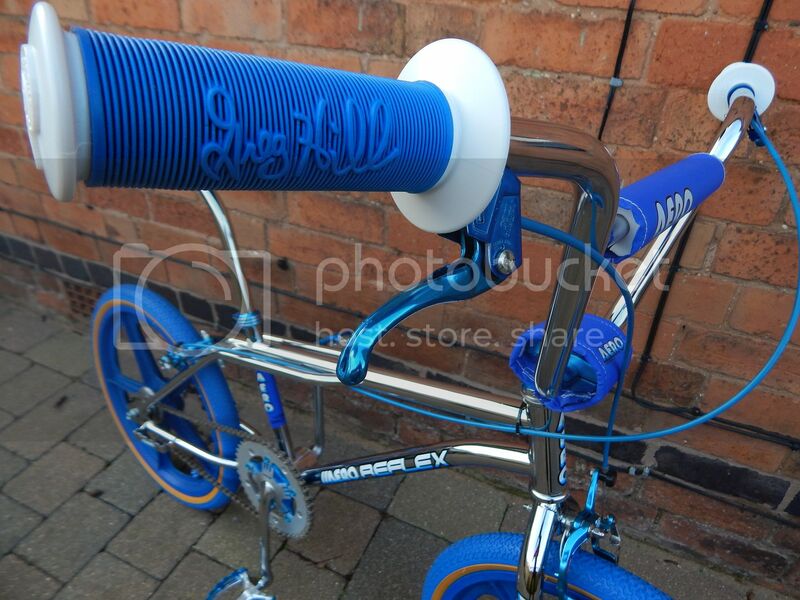 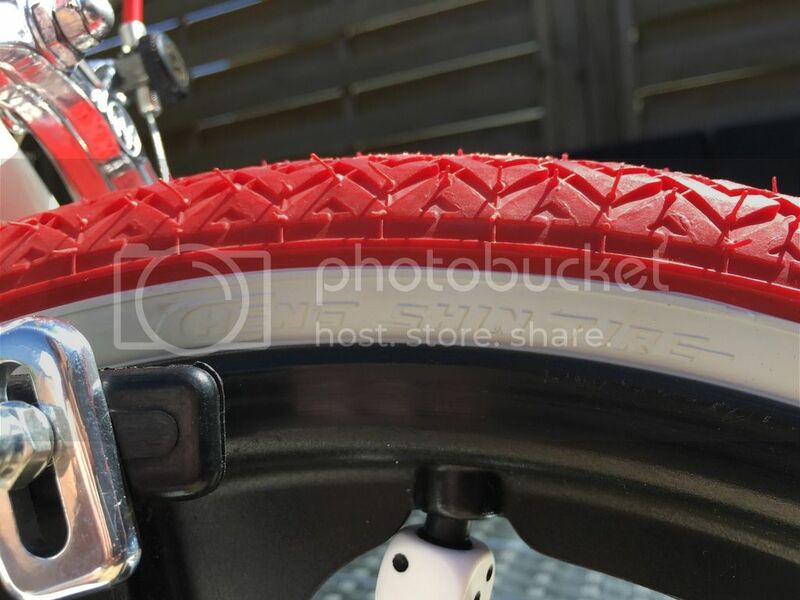 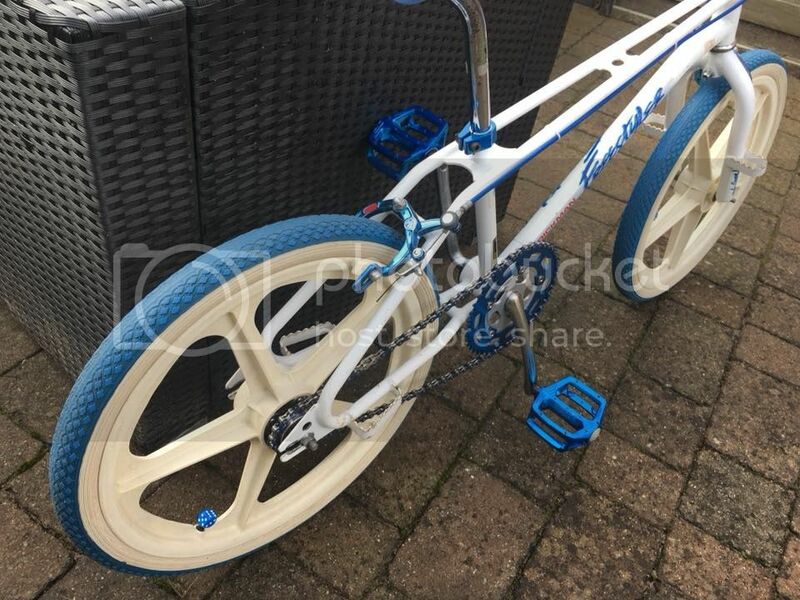 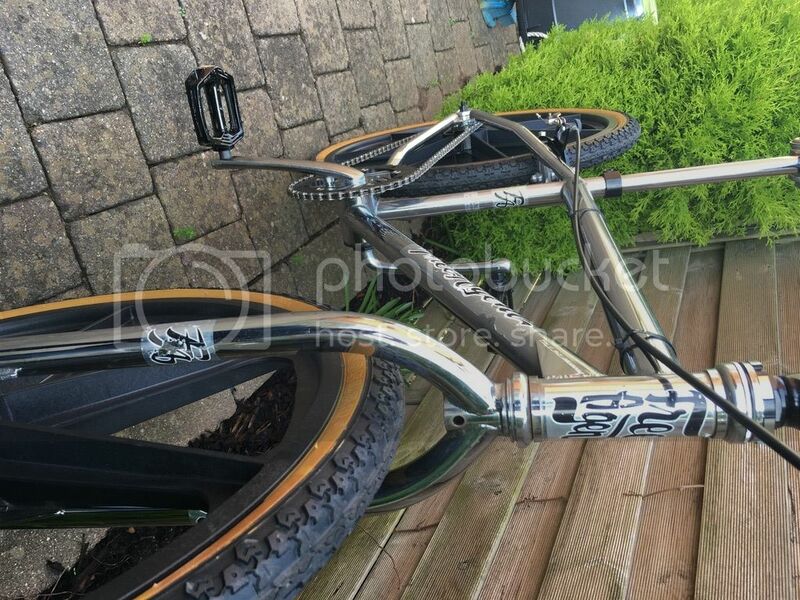 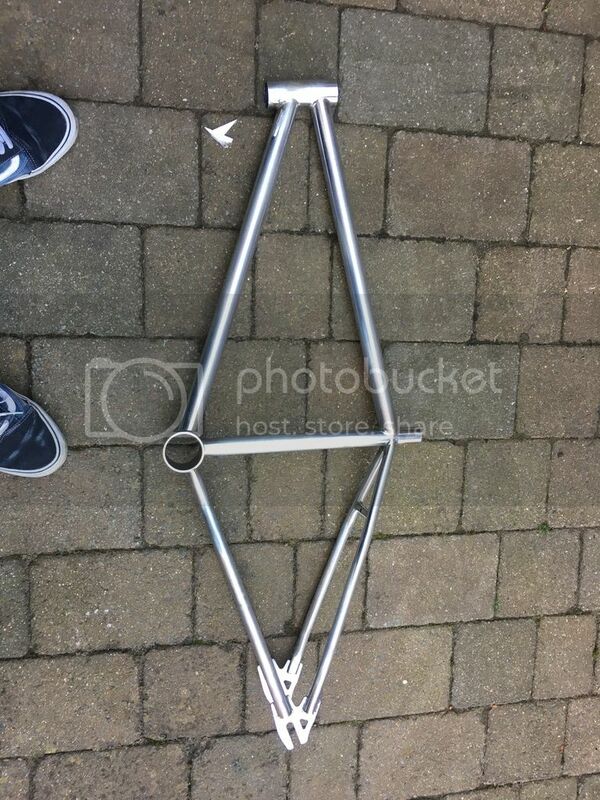 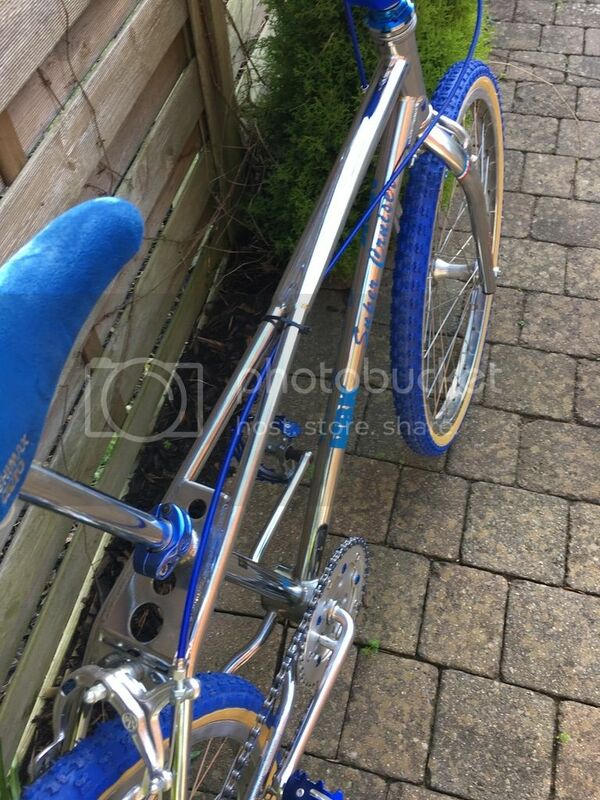 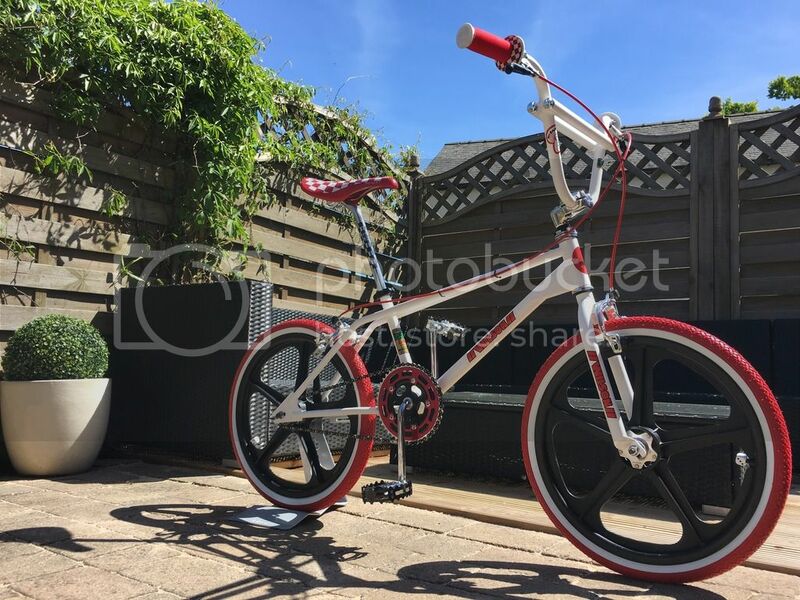 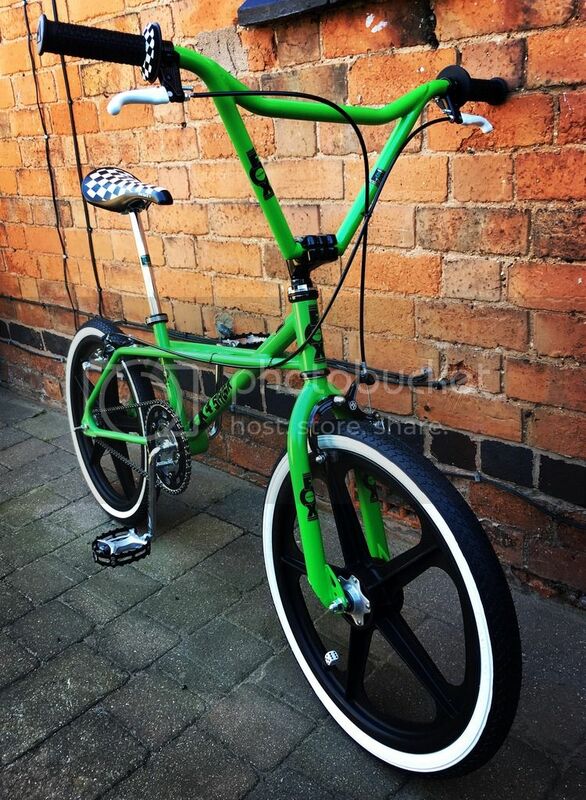 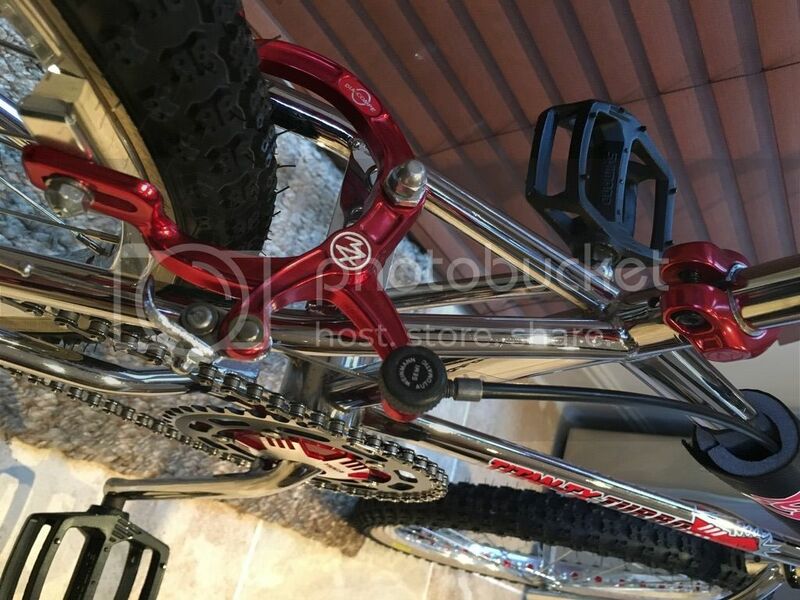 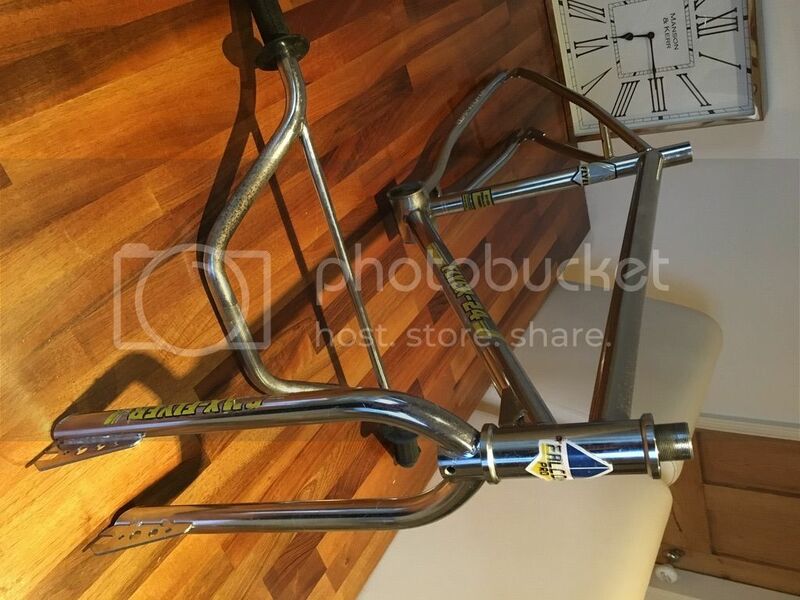 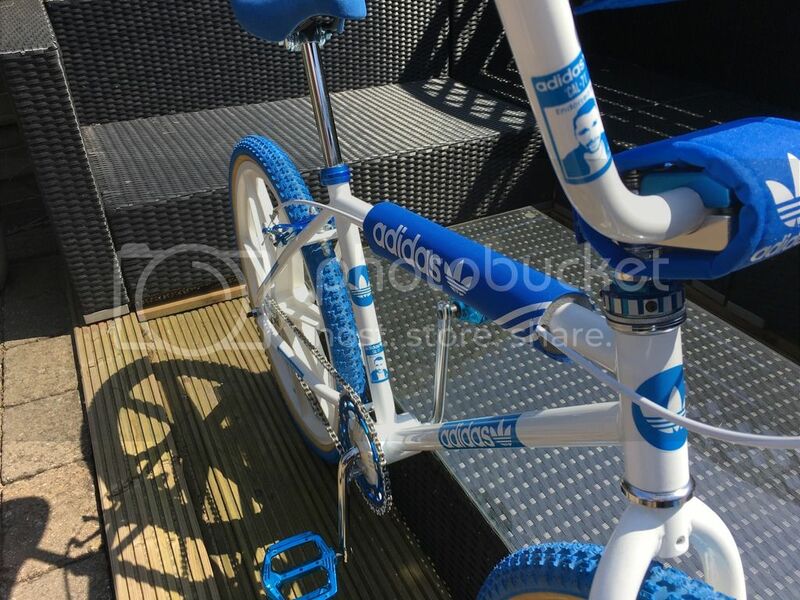 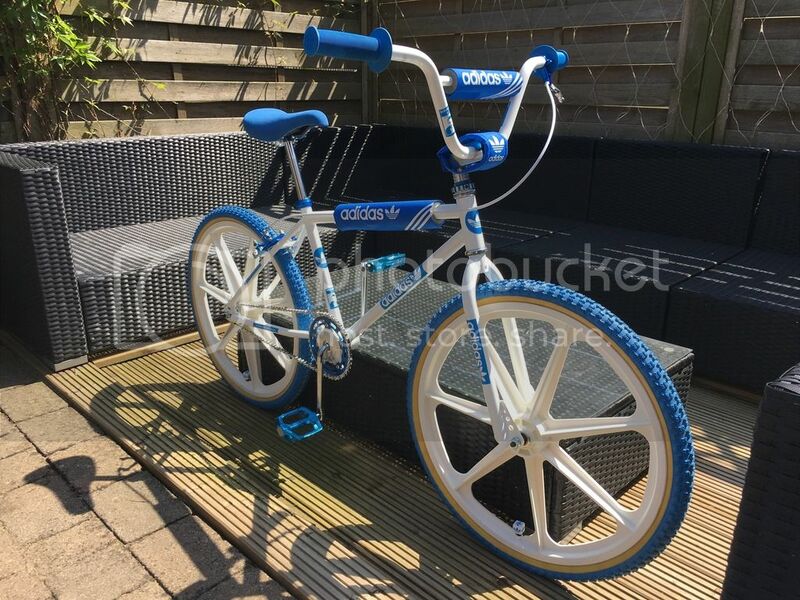 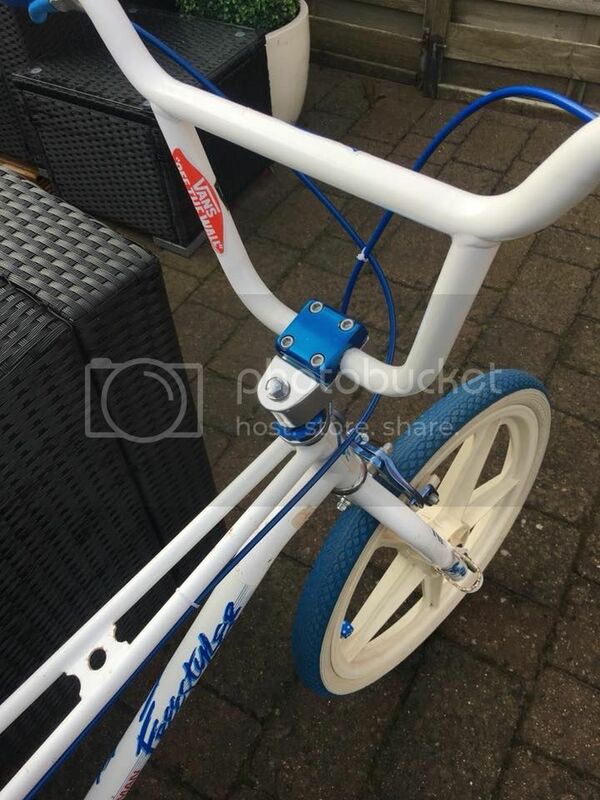 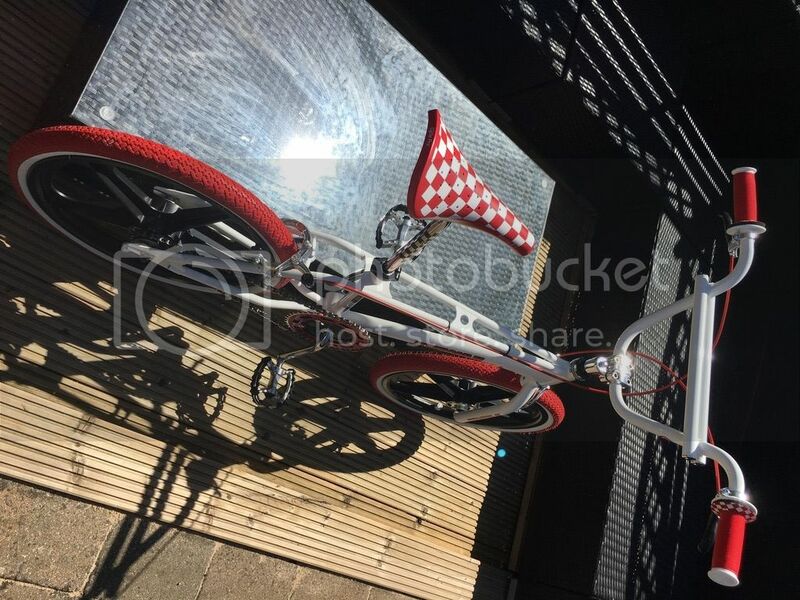 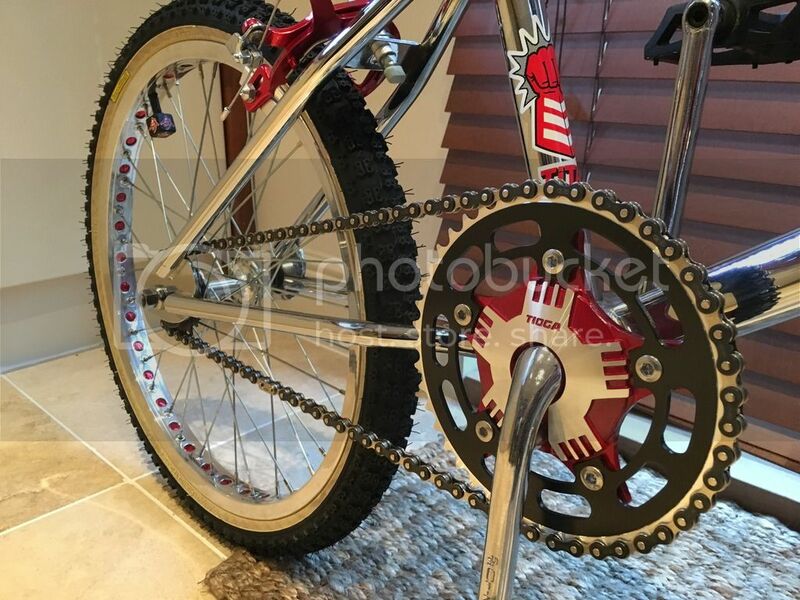 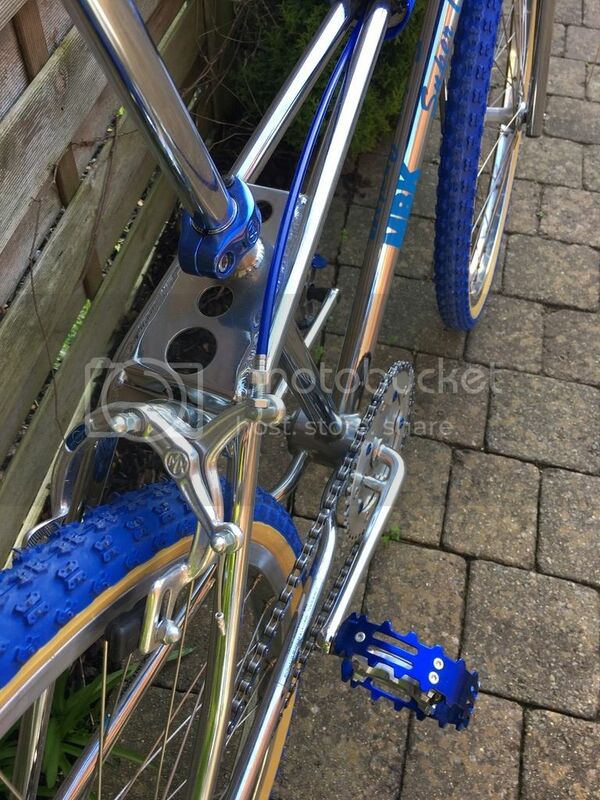 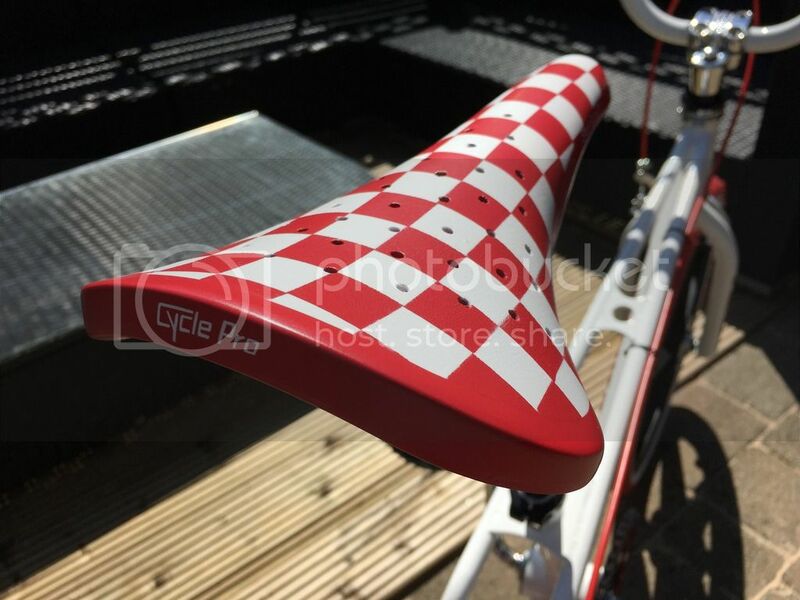 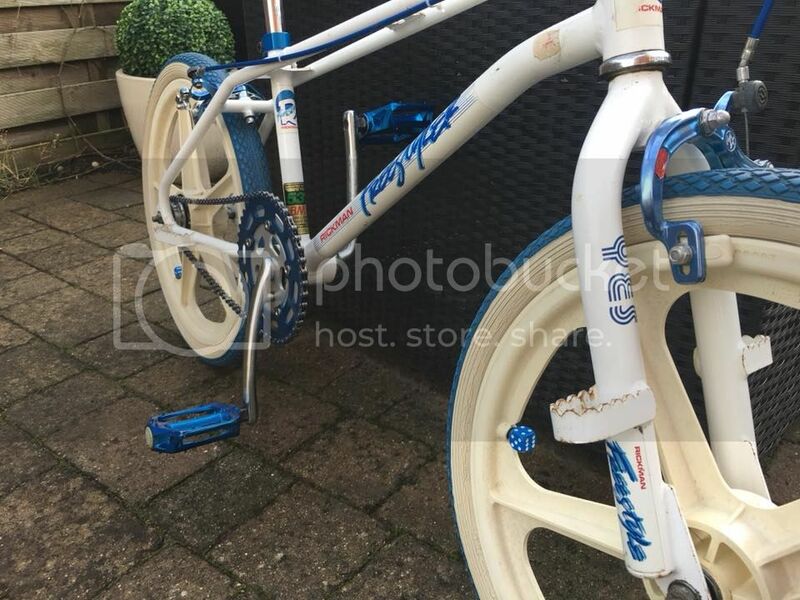 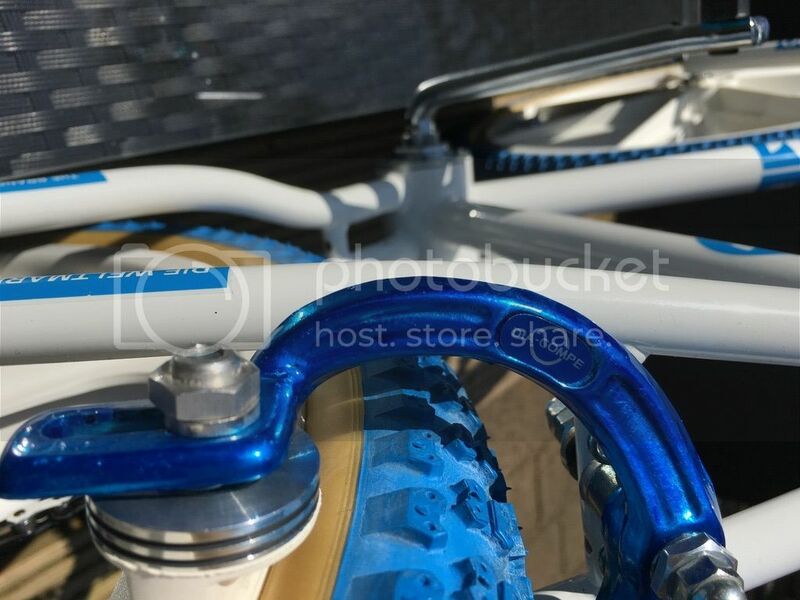 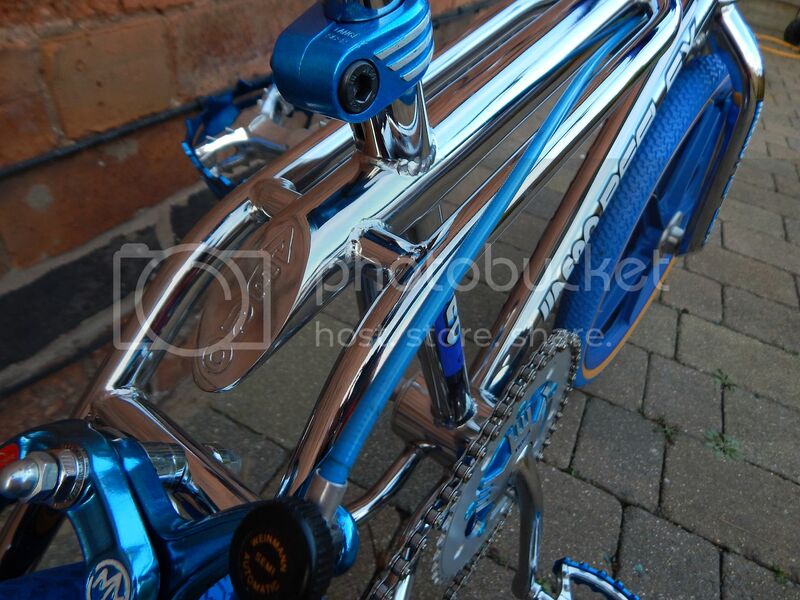 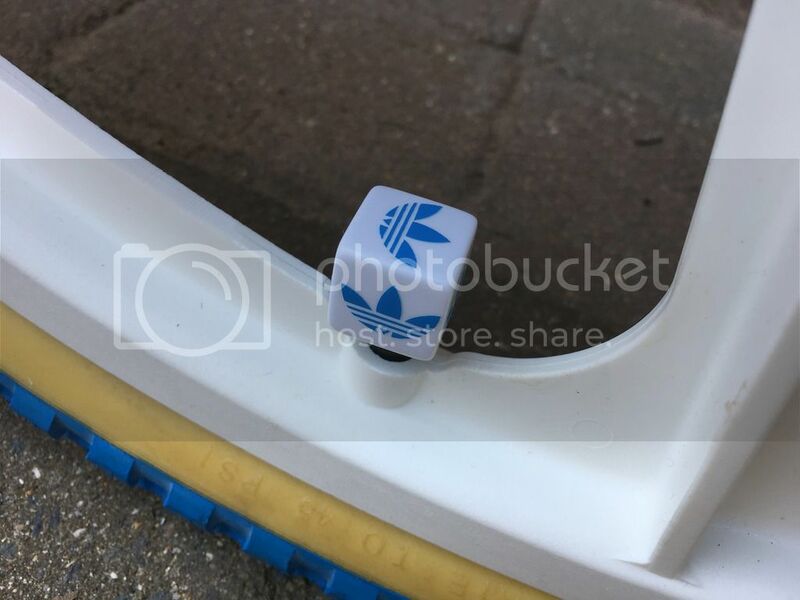 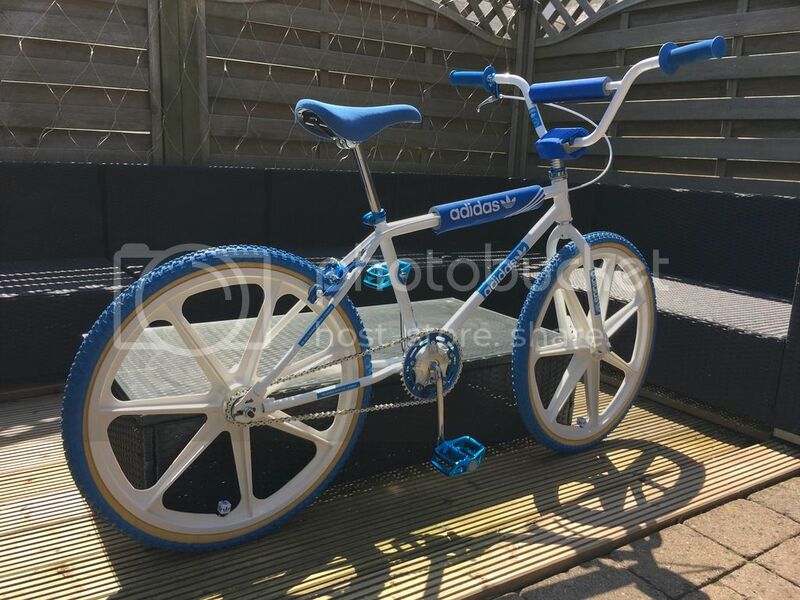 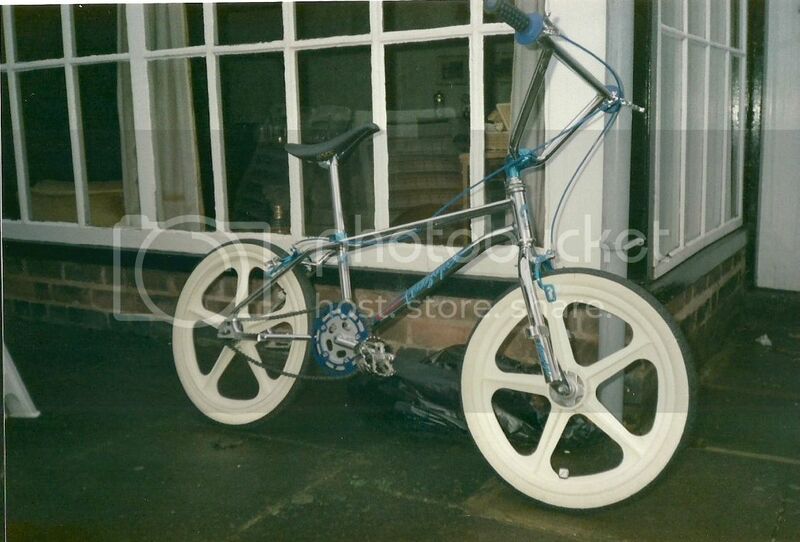 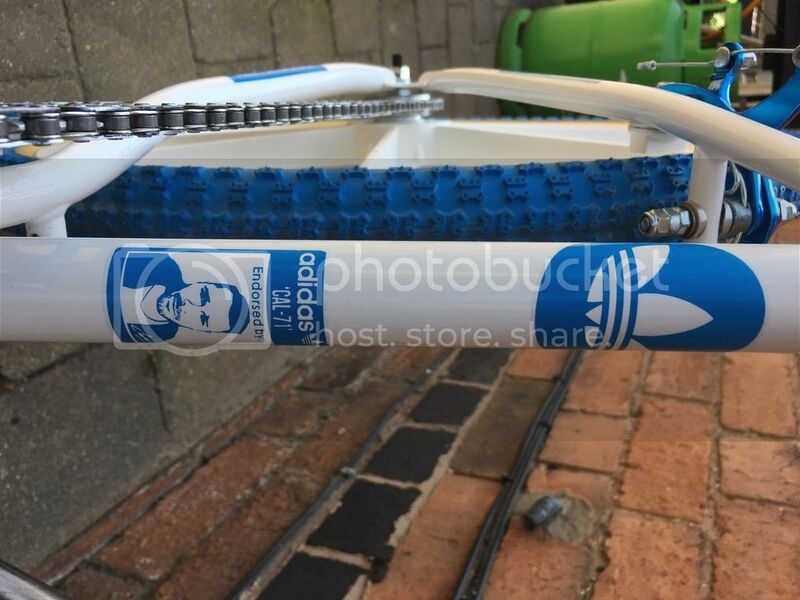 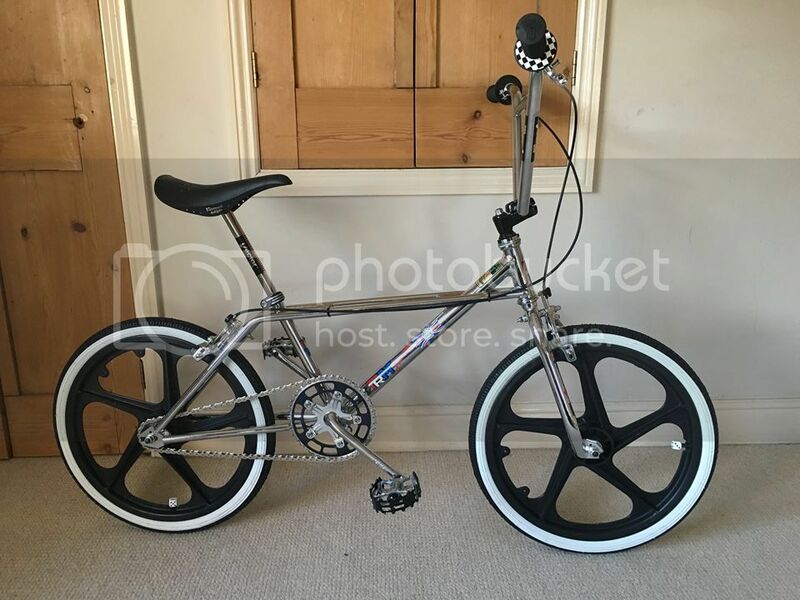 Having been totally inspired by the 2003 Kappa K-23 Adidas 24" Cruiser & Andrew Rigby's Adidas Diamond Back build I've been planning this for a while, its changed spec quite a few times & it's a rider so i didn't want to go crazy money wise . 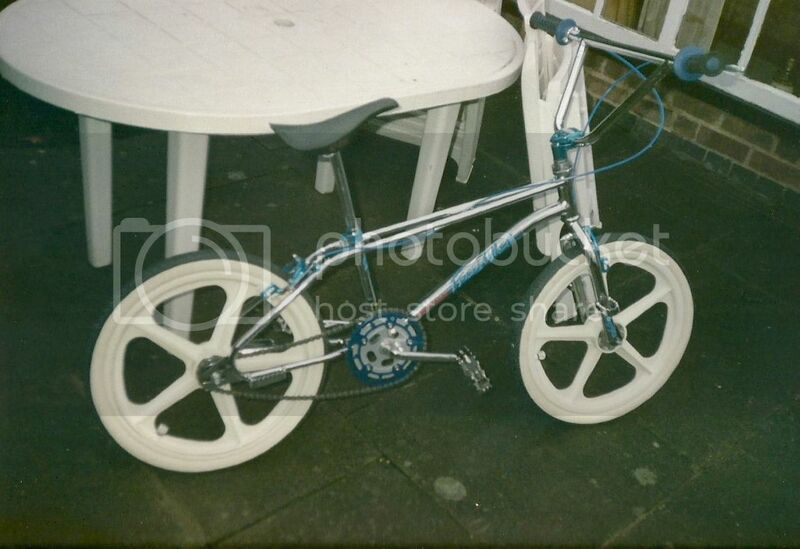 1984: Fox Factor F-1 4 Styler.